26th September - The season has changed for sure! 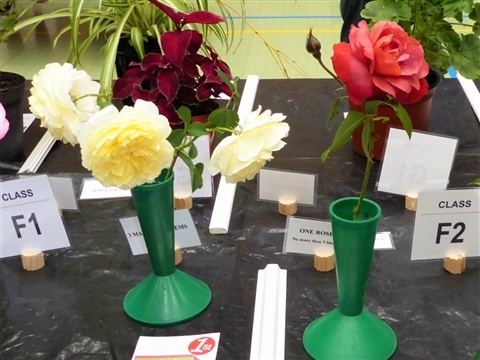 The weather this week has swung round from hot and sunny, to much chillier damp days, and the impact on the plants is noticeable. 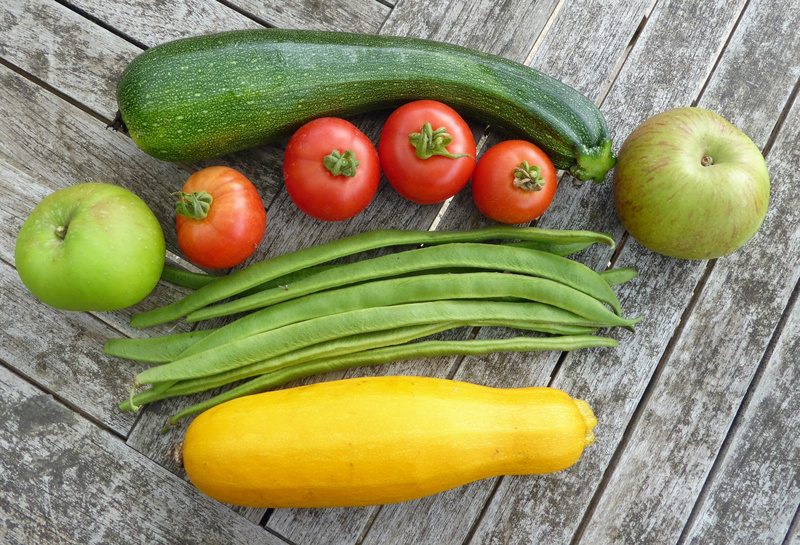 The runner beans have stopped flowering, the tomato plants have gone and the sweet peas are well and truly finished. Although this always feels a little sad, the little Spring cabbages and mustard planted out last week are thriving. There was a small glitch with the transplanted lettuces, when three in a row just collapsed. A quick furtle under the roots of the one at the end of the row soon revealed the culprit -- a wireworm! When we first took on Plot 146 there were hundreds, literally hundreds of wireworms, but removing them as we dug means we hardly ever see any now. They are Click Beetle larvae and stay as grubs for years before they pupate to become a beetle, and they can cause a lot of damage to potatoes and other roots. Best gone! I know this photo is not very exciting, but several people have asked me what wireworms look like.. so now you know. 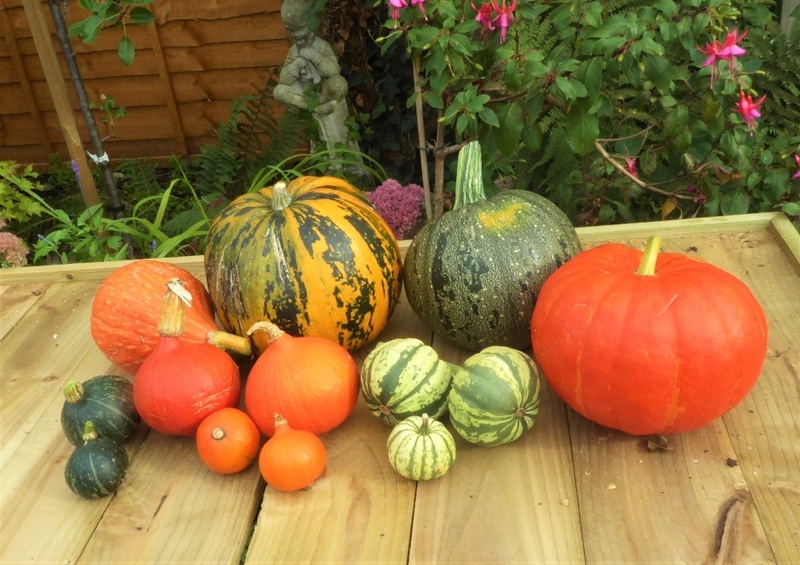 All our squashes are now safely gathered in, and you can see from the header photo that it is a very small harvest this year. After the difficult start with the plants dying suddenly from maggot damage to their roots, I am relieved to have any at all! 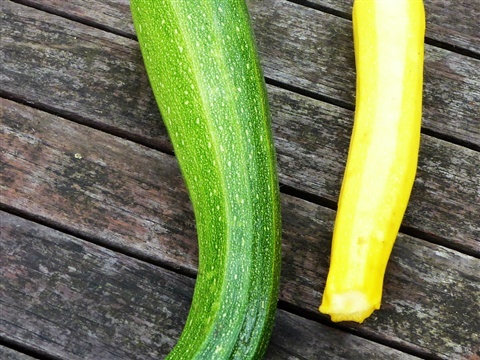 Left to right, there are two small green Delice, one Golden Autumn Hubbard, four Japanes Onion squashes (Uchiki Kuri) , two Kakai (the ones with naked seeds), one Rouge D'etamp and down at the front three Sweet Dumplings. The two Boers are shown here too... and that is it. 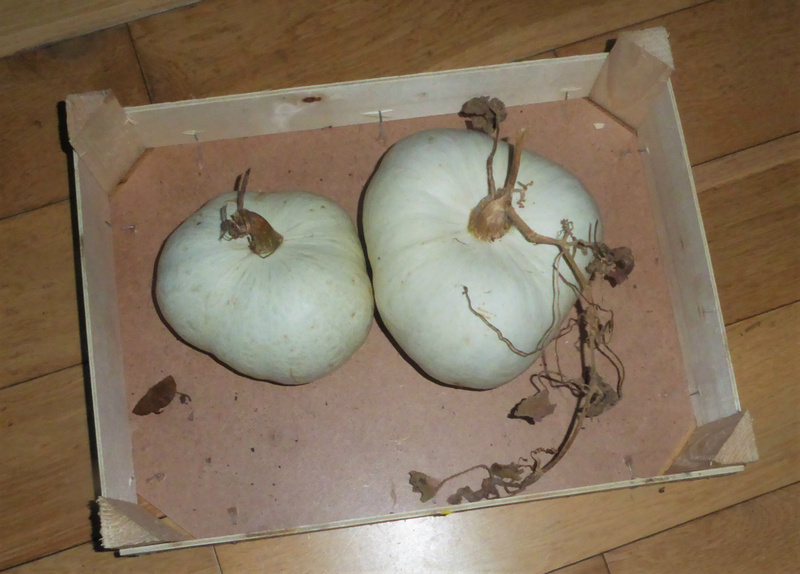 Usually the cupboard tops in the spare bedroom are groaning under the weight of squashes at this time in the year, but as I said, glad of what we have. They will all now ripen off for a few weeks before we even think of eating them, as the flesh becomes much tastier in storage. Picking the pattypans while they still have flowers attached is workng well, but that one plant is determined to give us enormous crops: Every day there are a few, and if I miss any they quickly bulk up, especially with all the rain. 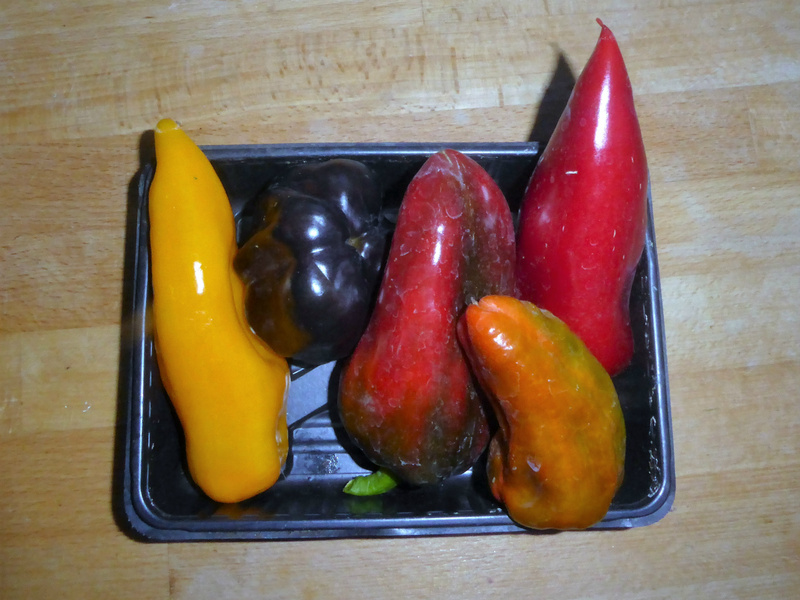 I am going to try them as a side dish with a curry meal to ring the changes. I'll keep you posted! and then these on Saturday! I know last week I said some of these crops had given their last harvests but there are always a few bits here and there that pop up. 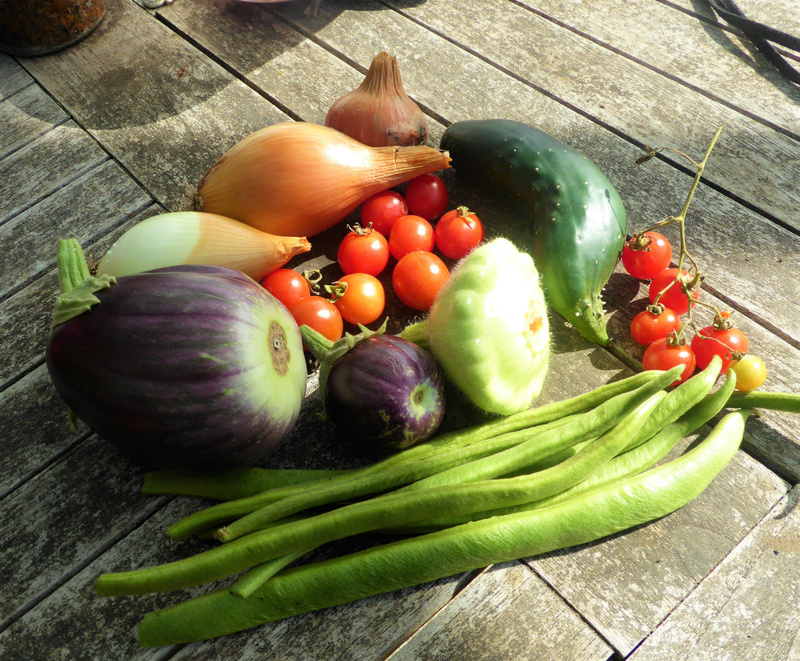 The aubergine plant on the table by our shed had two fruits lurking at the back, a couple of onions were unearthed when Abi was digging, a cucumber had hidden itself behind the trellis and a huge amount of small tomatoes are still hanging on the 100s &1000s plants. 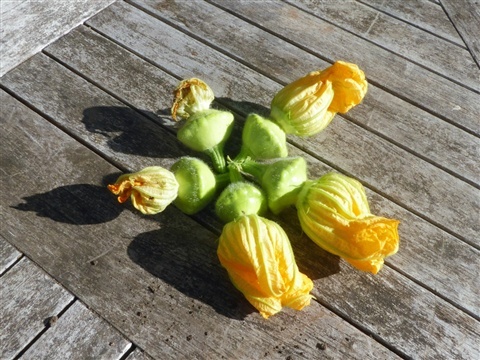 I am cutting these in strigs like currants and giving them to our granddaughters to pick off. Any not worth eating go to our daughter's chickens. A few runner beans also made an appearance, but the rest are staying put to give us next year's seeds. And then there is also Sunday's pattypan, clearly missed the day before! 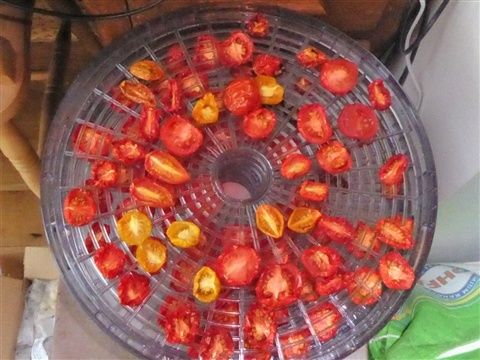 The dehydrator came out this week, and I now have a large jar of dried tomatoes. 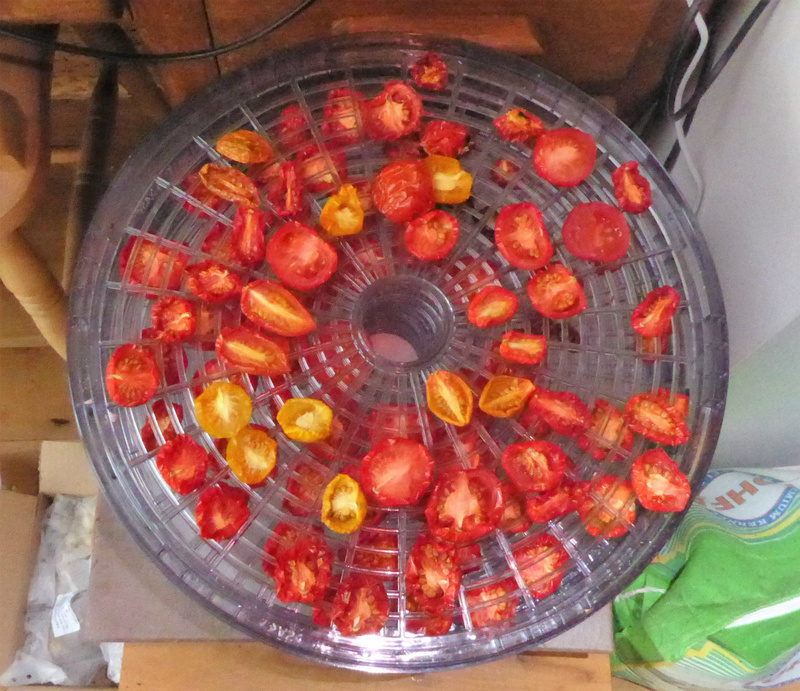 They are the last of the Red Robin cherries, which I cut in half to dry, and the smaller Moneymakers ripening at home, that I sliced into three. I shall be putting in another batch this afternoon. 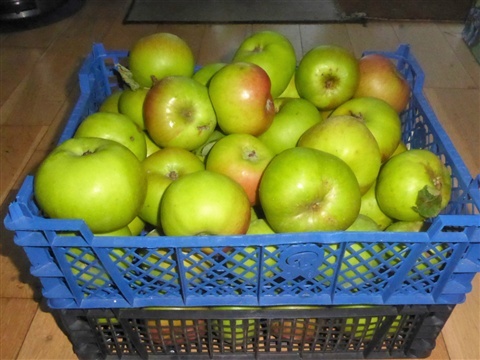 The eating apples we picked from the hedgerow on our site have now been turned into apple crisps, which are an especially favourite of our youngest granddaughter. It always makes the house smell so nice when they are drying. 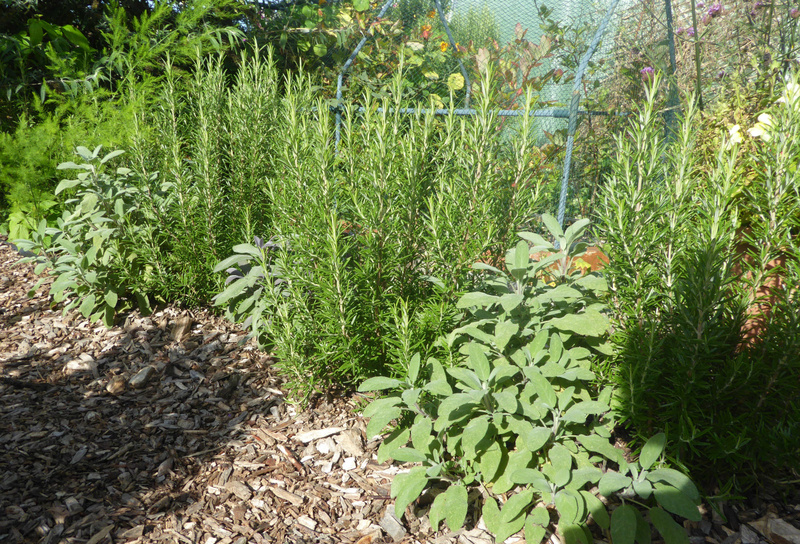 Herbs and Spices are an important part of our harvest at this time in the year. The oregano plants that edge one side of the new path between the plots have thrived, and we cut bunches of the flowering growth to dry. We saw them harvested like this in Greece one year, and this is the first time we have had enough to be able to do this ourselves. Hanging on the side of the shed they get sunshine but are protected from rain. Another couple of days and I'll bring them home, to store in cellophane bags. 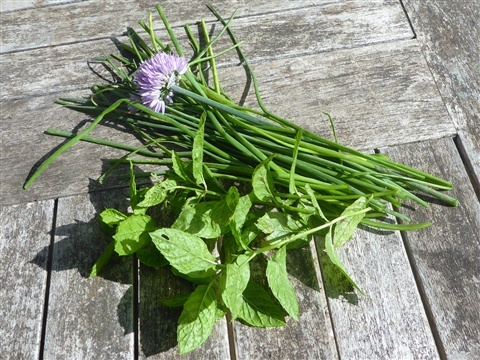 Cutting back the chives hard in mid-Summer has worked well... we have a good crop of fresh leaves and some flowers too. This cut was to add to mashed potato. 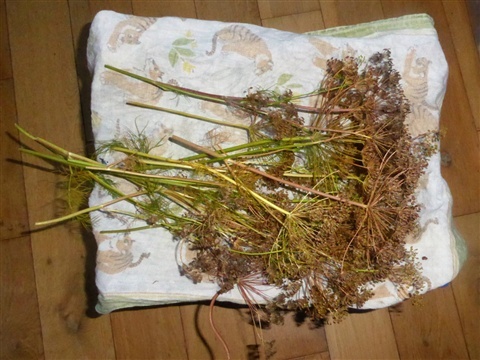 And more dill seeds are drying at home. Some of these will be for our daughter, to add to her sour dough bread. A 1m row of dill has been an excellent investment, with flowers and leaves for pickles and now masses of seed! 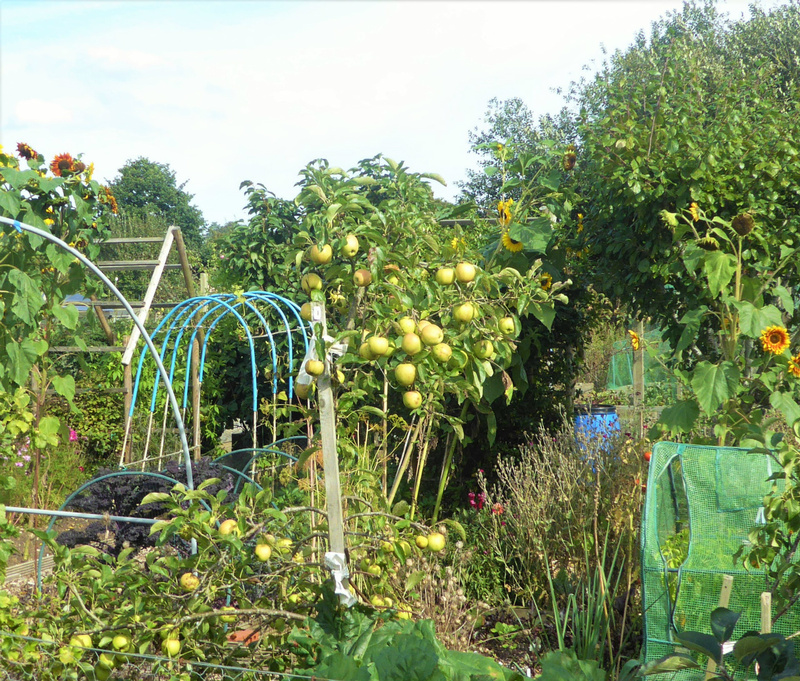 Fruit harvests are almost finished now. 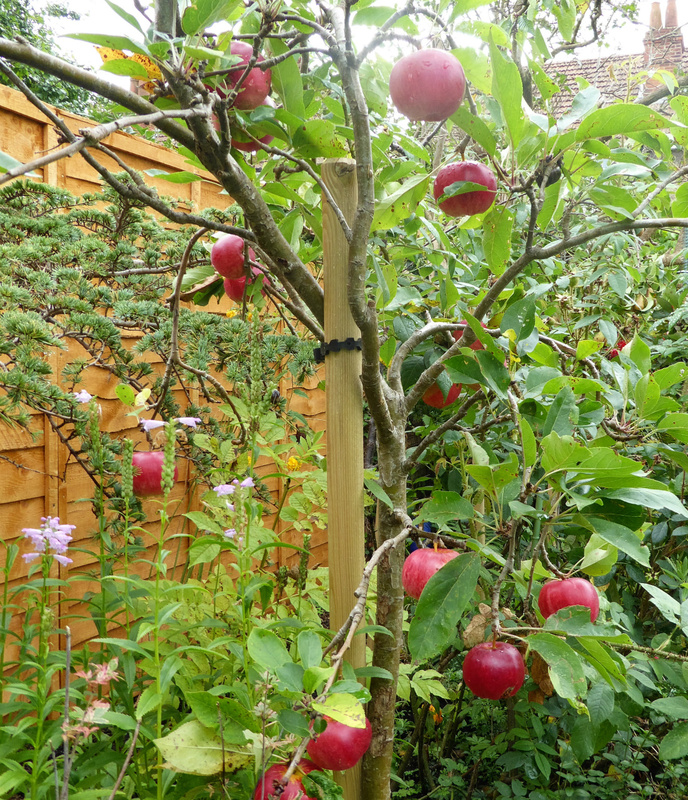 The Discovery apple tree in our garden glows with colour in the sunshine. 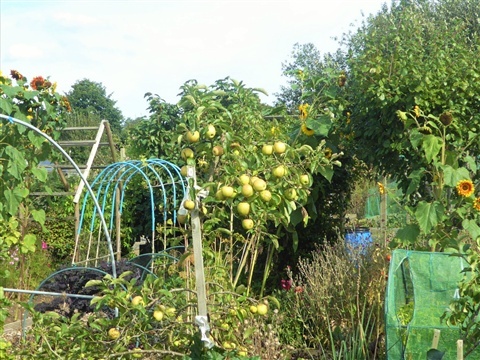 Thinning the apples and keeping the tree well watered has made a big difference to the size of the apples: you could almost see them swelling day by day. They will be eaten fairly quickly! On Plot 146 the James Greaves tree did not flower this year, but the Greensleeves has a reasonable crop. 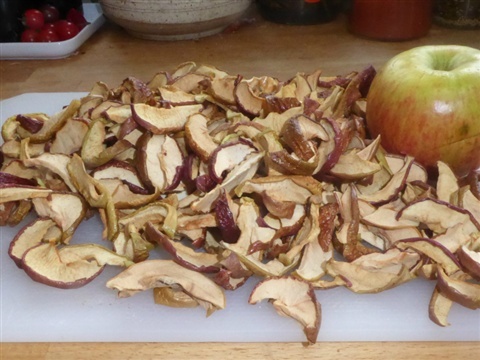 I did not thin the apples enough so they are fairly small and may well be headed for the dehydrator. No bad thing to stock up on apple crsips while we can! 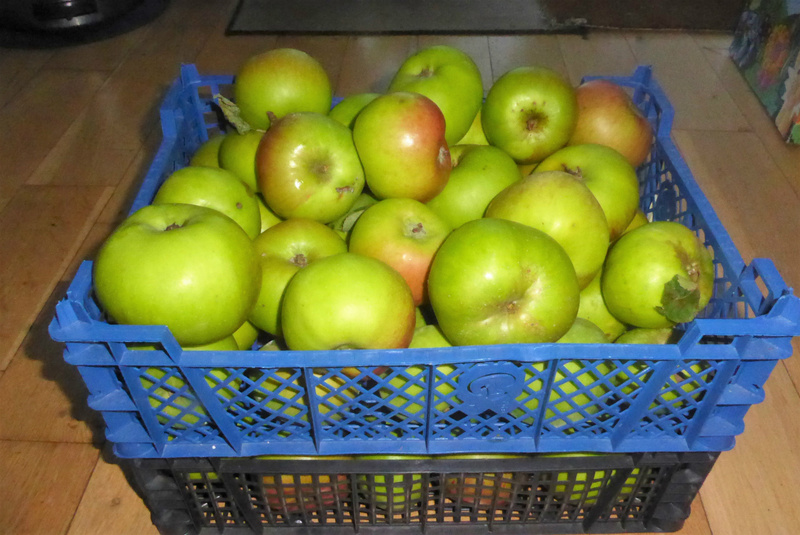 The crop from our inherited Bramley Seedling on Plot 145 has been excellent, Quite a lot were lost to rats, that climbed the tree to gnaw on the apples, and the windfalls had maggots in their cores, but we harvested 14 Kg of sound fruit altogether, more than enough for our use. Some have already been used in a large batch of Mixed Tomato Chutney, several Blackberry & Apple Crumbles and frozen Apple Pie fillings too. 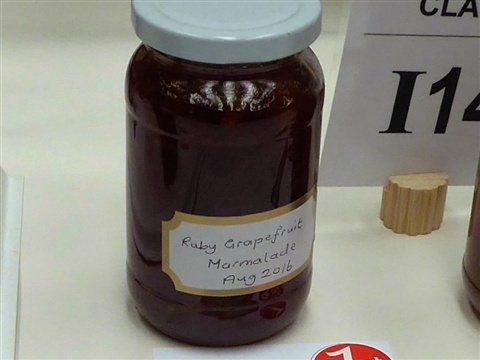 This week more will go towards the Mint & Apple Jelly. 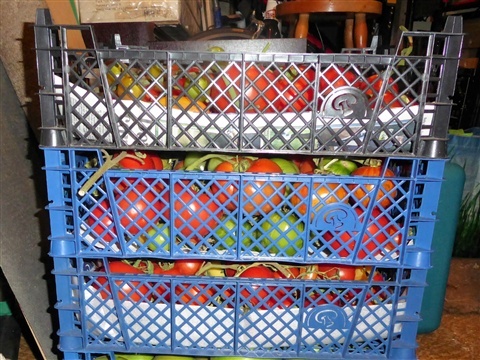 We have also been fortunate to have been gifted some crops from others' surpluses, although you might chuckle at the first of these, given the 27.45Kg weight of our own tomato harvest: our neighbour gave us 5kg of tomatoes as she had more than she needed. More jars of sauce coming up I think. 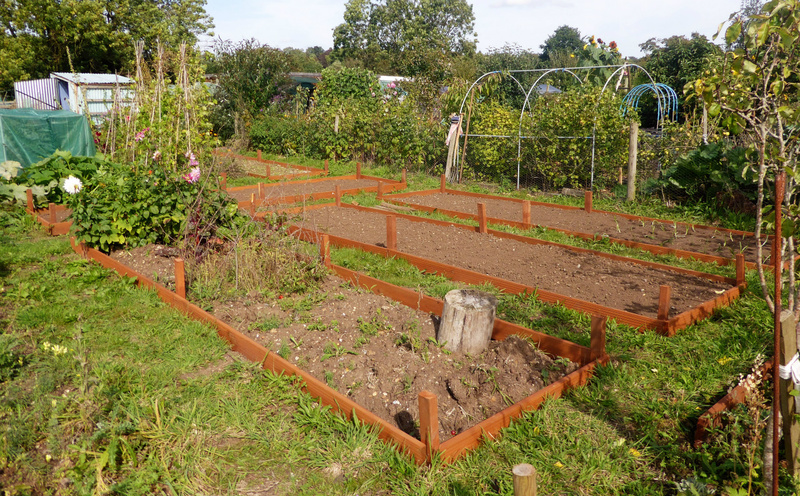 Here in Reading we have an initiative called Food for Families and donations have been requested from plot holders. 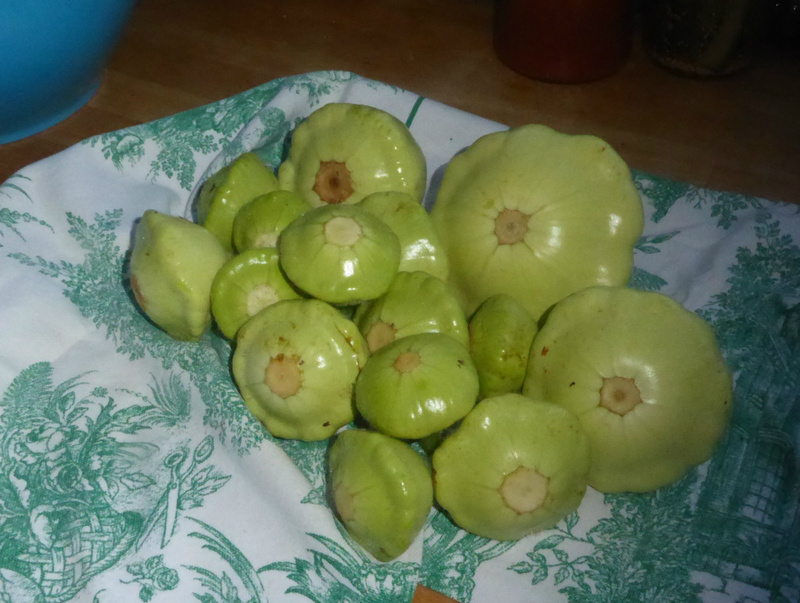 We gave them the remaining large Pattypans... nice to think they will not be wasted. 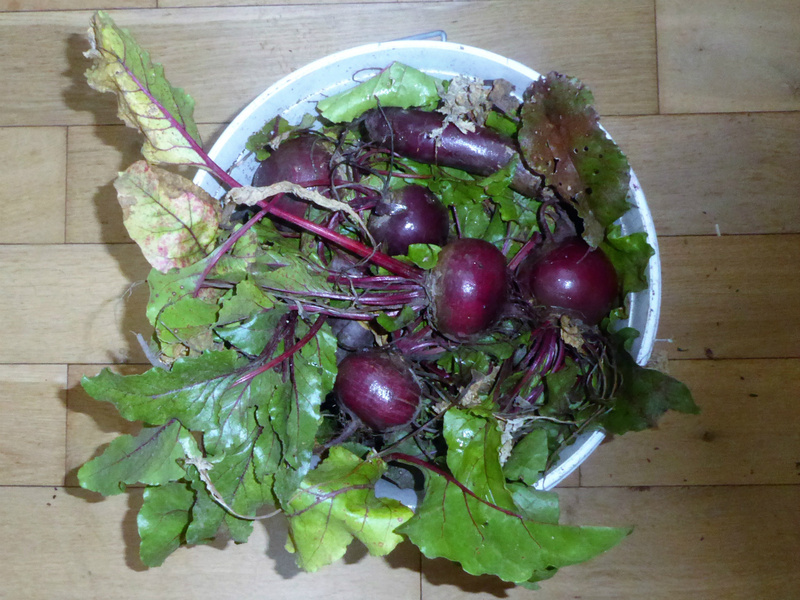 Beetroot, runner beans, onions and kale have also been in the crates so hopefully something tasty will be cooked up for people to feast on next weekend. 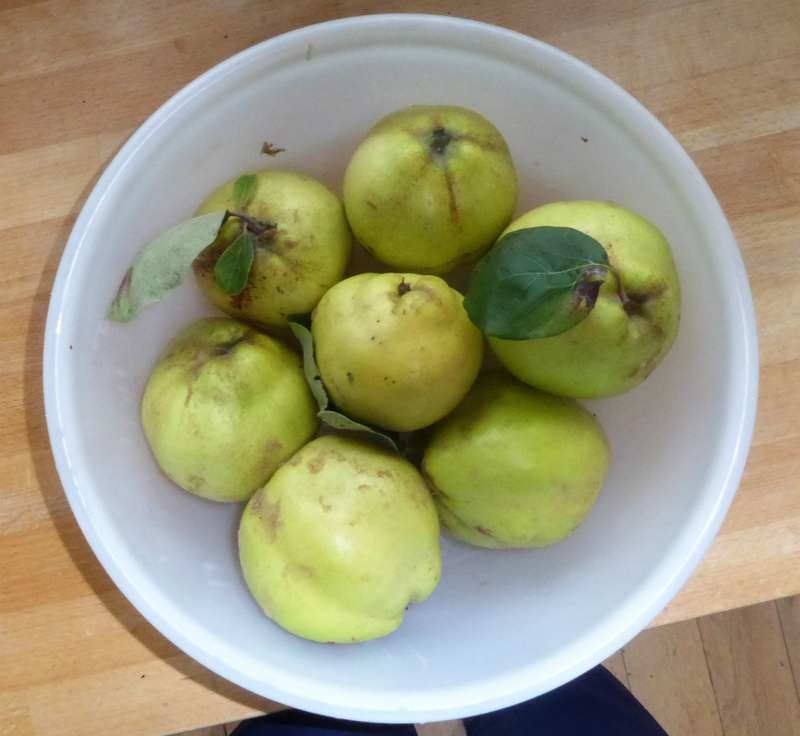 And some Quinces! 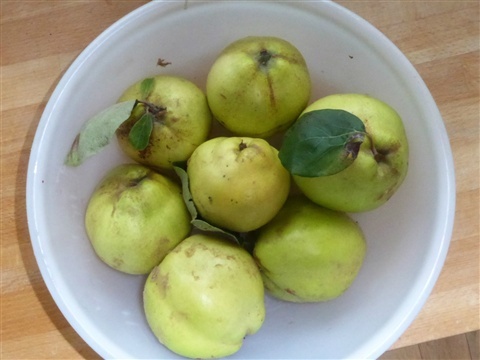 Quince Brandy and Quince Jelly are on the menu for these perfumed lovelies! They look so unpromising, but they are truly scrumptious! 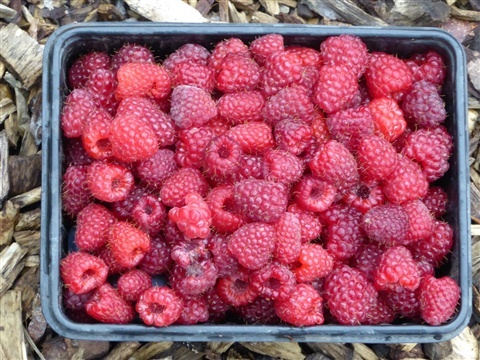 As well as harvesting and preserving, we have been busy out on the plots this week. Abi has now dug over most of the beds, and at long last the remaining leek plants have been planted out from their tray. You can just see them in the far right of this picture. 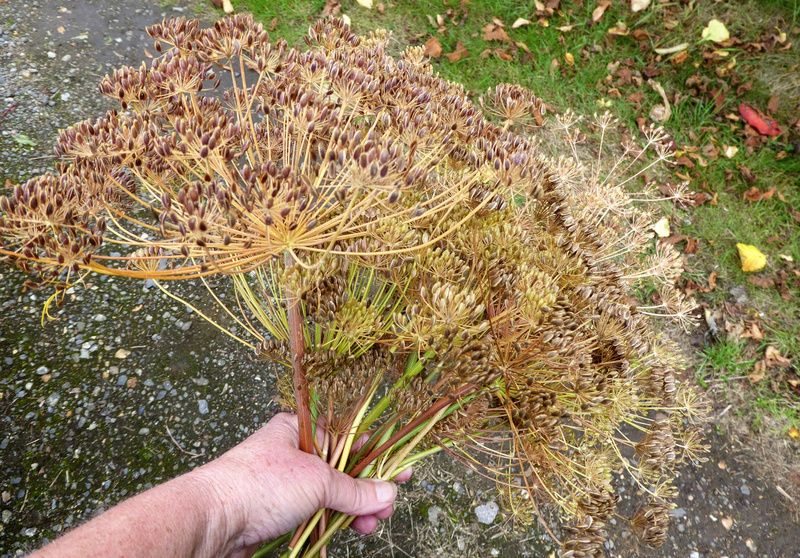 It is a bit late in the year, but even if they only form skinny leeks eventually this will be better than nothing. The leeks on #146 are growing away well, but as usual, leek moths have infested the leaves. On the advice of a friend, I have cut most of these off. The plants will continue to grow leaves and hopefully these will be pest free. I spent several hours sorting through our wood and canes in the wood store and making sure everything is safely accessible, as well as making space for the bean sticks that will be brought in soon. A tedious and unglamorous job, but one which will make life easier through the next few weeks as things start to get put away again. 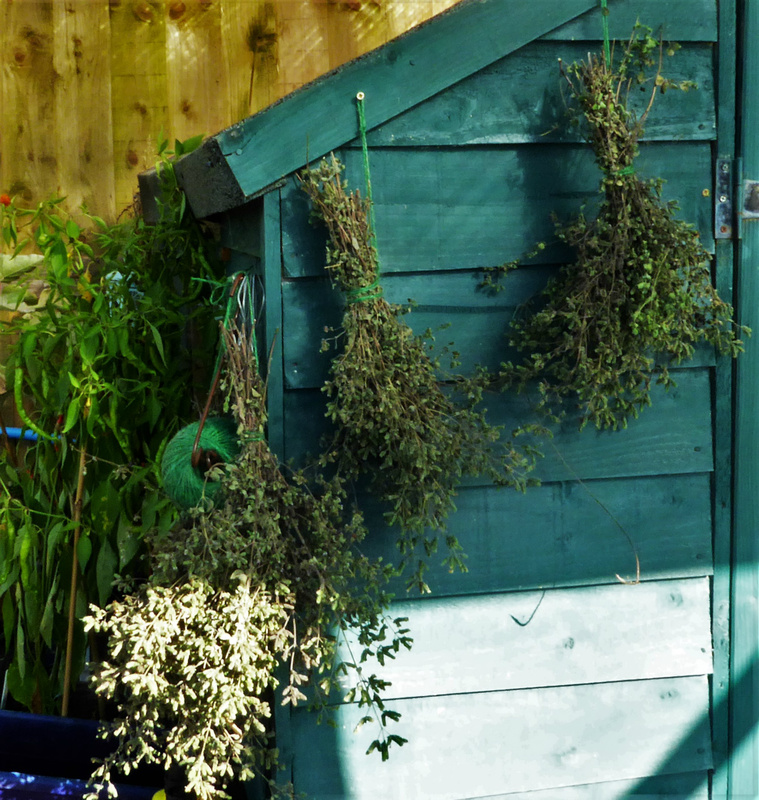 The onion drying rack is safely behind the shed, as we won't need it again for at least 8 months! I started this week's blog with a photograph of a wireworm, so thought I would include some other wildlife pictures, which I hope you think are interesting, and maybe more attractive than a wireworm too. 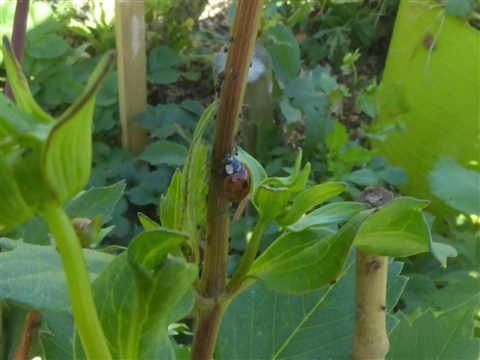 There is a late outbreak of blackfly, and look who has turned up to help. 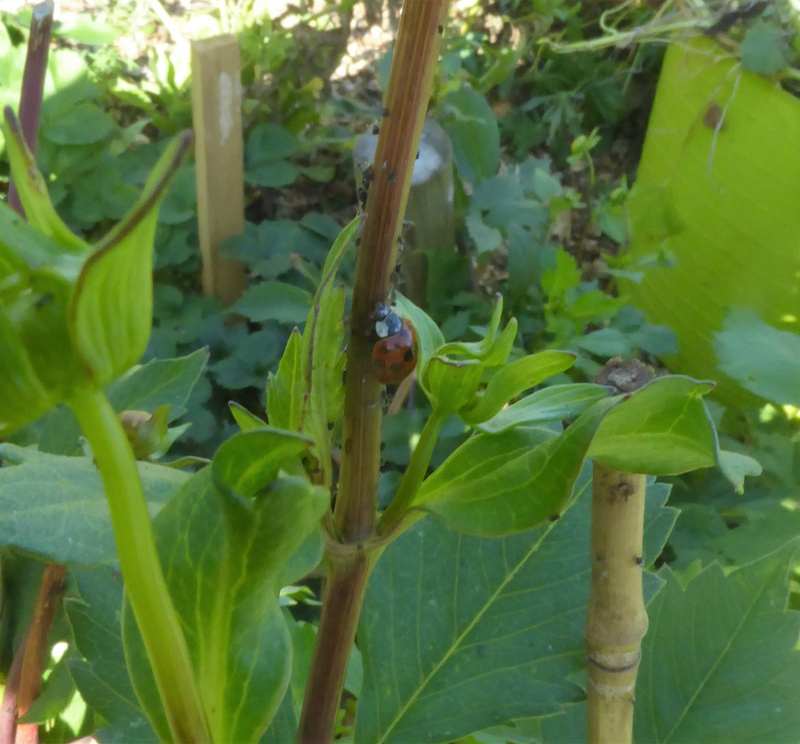 Voracious ladybirds eating their way through the hordes!! 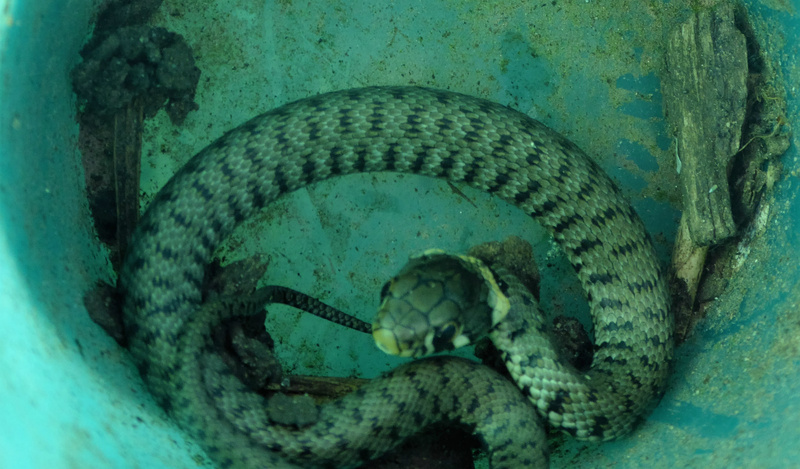 And this little grass snake was in the chicken enclosure, and luckily was rescued before they ate him, by a little girl using a drinks cup. 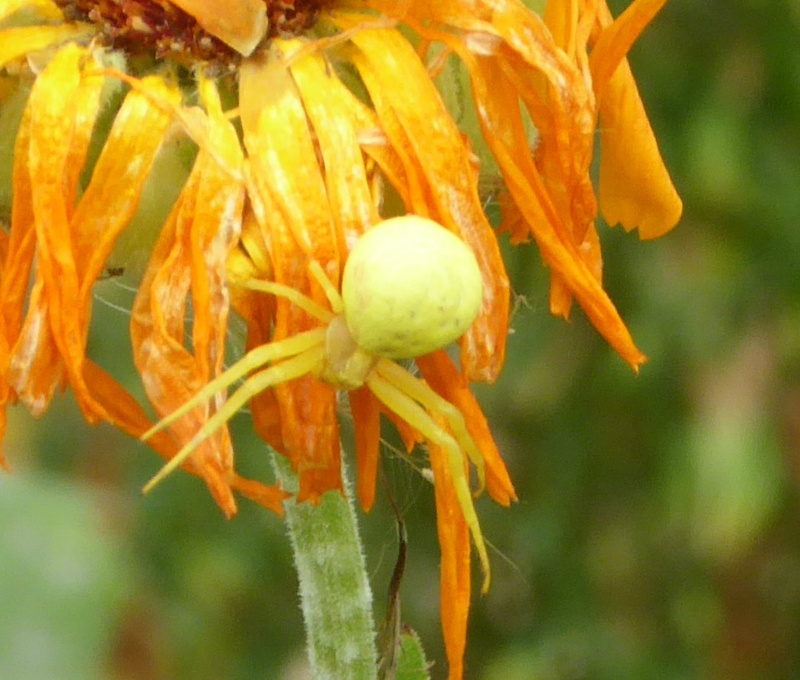 And to end, a beautiful little Crab Spider on a calendula flower. 19th September - Super hot... then Winter clothes ... and the Harvest Moon, all in one week! 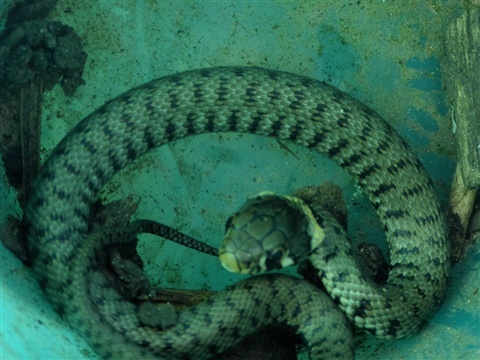 This has definitely been a week of extremes: 30+ °C , meltingly hot on the day I decided to clear away all the remains of plants in the mini-tunnel and giant cloche, a massive thunderstorm with torrential rain and then days when the temperature stayed in the low teens. Amazingly the plants just seem to get on with it!! The full moon closest to the Autumn Equinox, which this year falls on 22nd of this month, is known as the Harvest Moon. Unusually this year there will be a partial (or penumbral) eclipse of this full moon, when the Earth' shadow falls across the edge of the moon's face. Unfortunately it is likely to be cloudy here at 3:00 am tomorrow, so I shall not be staying up to see it. Anywhere the skies are clear though in most of Europe, Asia, Africa and Australasia you might get a good view though. 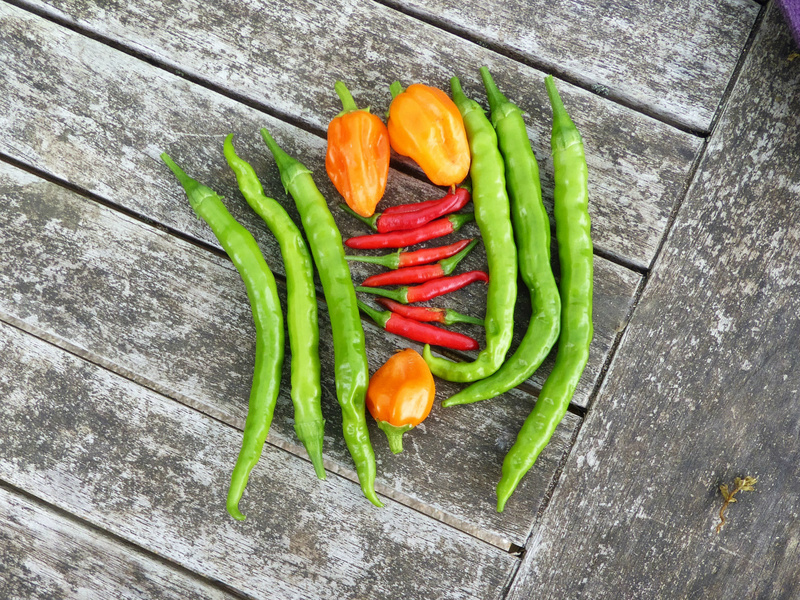 Harvest Monday has a little less than recently to report, and I daresay as the Summer bounties come to an end it will be less as we move through the Autumn. 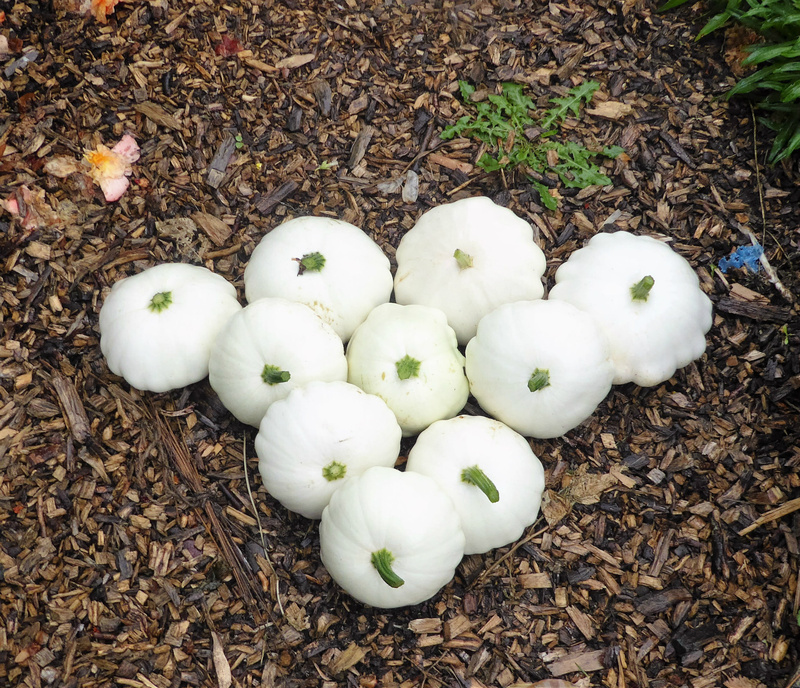 There was one lurking beneath the leaves, which escaped and turned into a white beast that had to join the others in the pot outside, making 23 we have harvested so far. I am still managing to find homes for them, and using up one here or there too, so none will be going into the compost. (That total does not include the baby ones) There are only four left in that pot though, thank goodness! 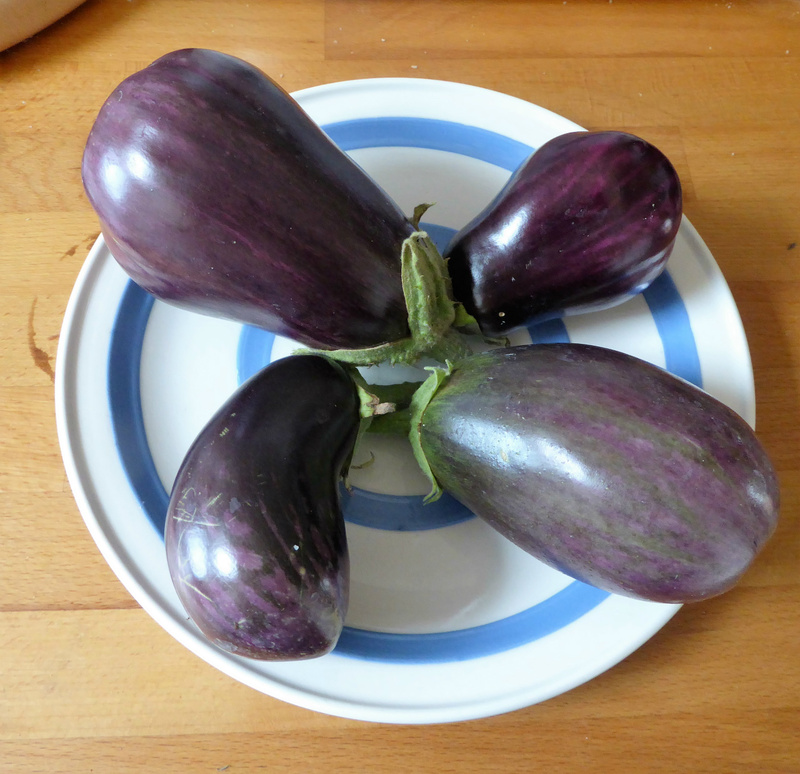 Four more aubergines, which are only just ripe, but I picked them as I needed to empty out their pots and use the space for something else. We have had 16 overall. 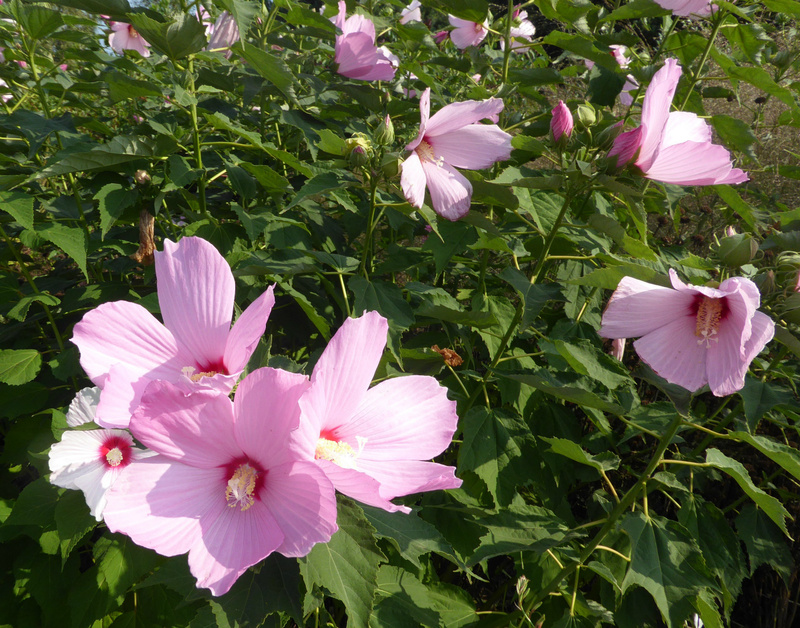 The grafted plants grew vast, and flowered earlier than the seed-sown ones, which still gave a good crop. More choice with seed sown too. The last Pak Choi from the sowing made a few weeks back. 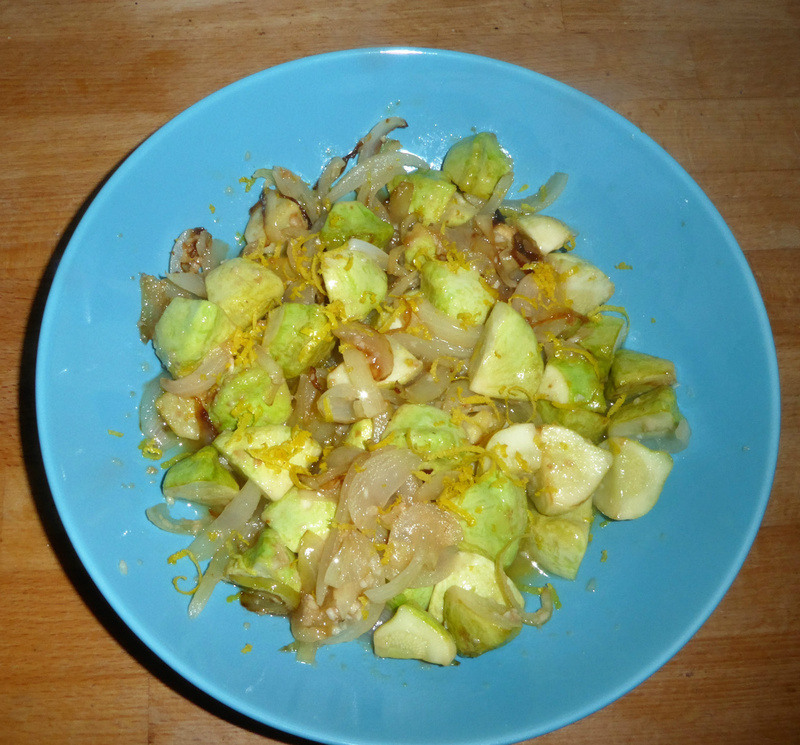 It is a bit holey, thanks to a slug or two, but went well in a stir fry nonetheless. Another crop is now planted out in the giant cloche. It might be a bit late but I hope the protection they have helps. 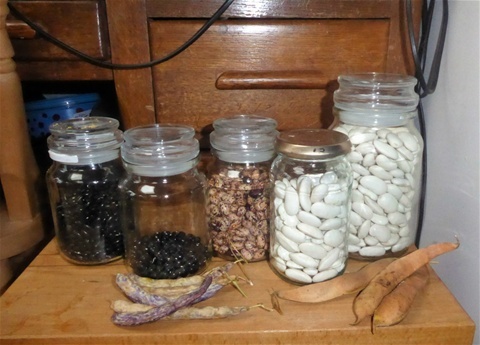 Most of the drying beans are now in their jars. 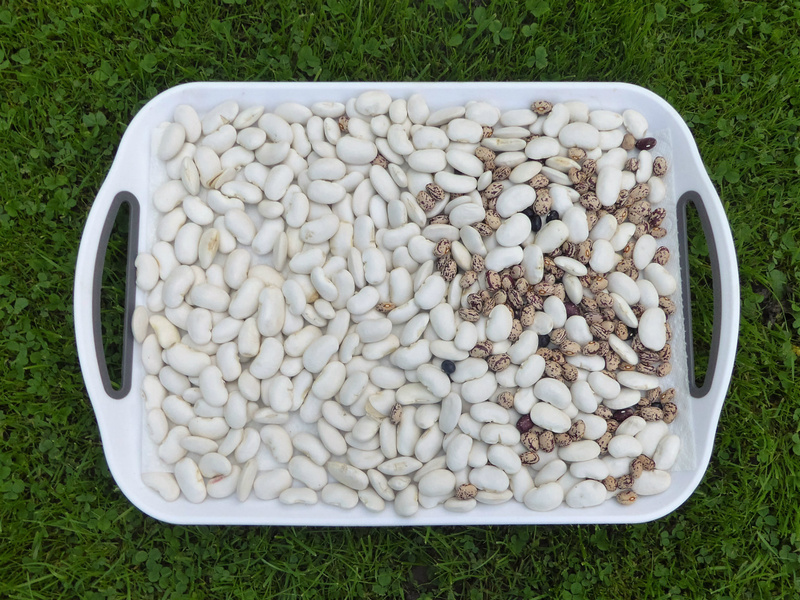 From left to right here are: Cherokee Trail of Tears, Polatschka, Borlotti and Greek Gigantes. The CToT flowered quickly and were harvested and dried several weeks ago, whereas the pods of the Polatschkas are still not even ready to pick. 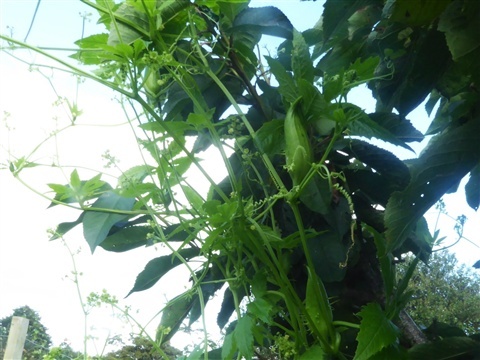 The plants flowered late and beneath the foliage, so I had no idea how many pods there were until the leaves started to die back. Annoyingly, the reliable climbing borlotti harvest was severely reduced when that little rabbit munched through lots of the stems at ground level so the flowering shoots all died back. Although the plants grew again, it was far too late for any flowers, let alone pods. The few that escaped his attention did well, so at least we do have a crop of sorts. 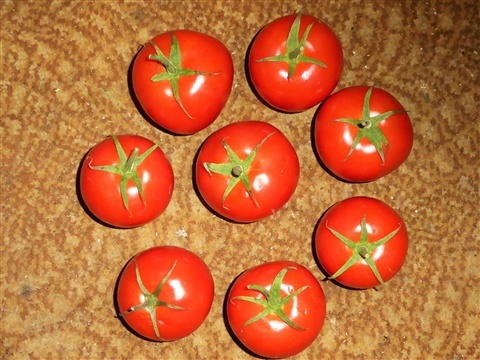 The Greek Gigantes which Real Seeds had told me might have poor germination, grew well from the off, and from 18 plants, this is our harvest, plus a handful that I wasn't sure if they would store well as they have cracked skins. I have kept these separate and we shall eat them first, unless they rot of course. 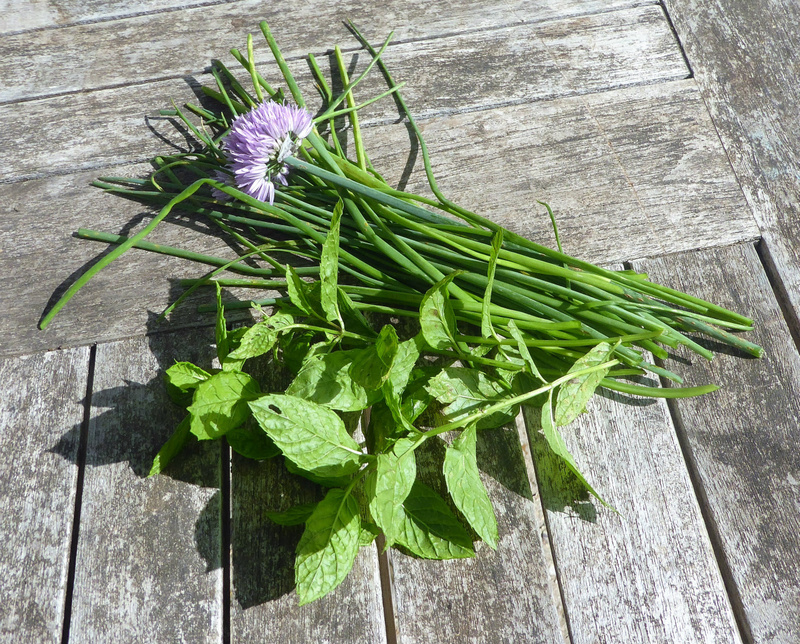 They look good, but until we taste them I cannot say whether we shall grow them again. 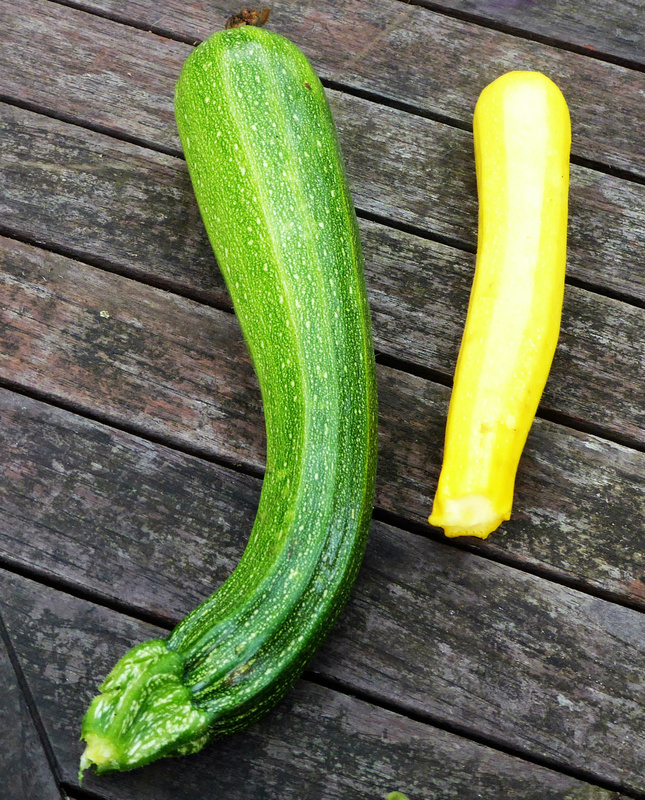 There are just two more vegetables we have harvested as a "first" this week, and for both it will be the last for sure! Just remind me not to grow things that take up a huge space for little return!! I am such a sucker for a new fruit. Kiwano or Jelly melon sounded so delicious! The single plant filled a third of the mini-tunnel with foliage and it only when I started to clear this away that I found these three tiny spiky fruits. All that for three titchy ones. 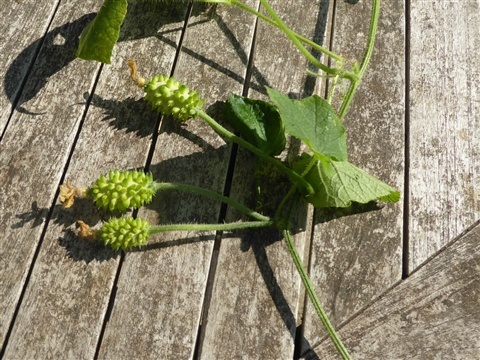 Leave it off the list, in the same way as I now avoid growing cucamelons. And that is the end of this week's harvests. It has been a really busy week and I have not had as much time as usual to work at the plots, but I have managed to plant out some small plants in the giant cloche and the minitunnel. 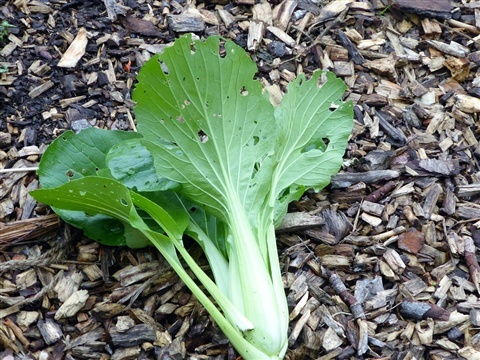 Some of these are only there temporarily whilst Abi finishes off the sides of the beds on #145: Spring Green Cabbage, Chinese Kale (Kailaan) and Perpetual Spinach. 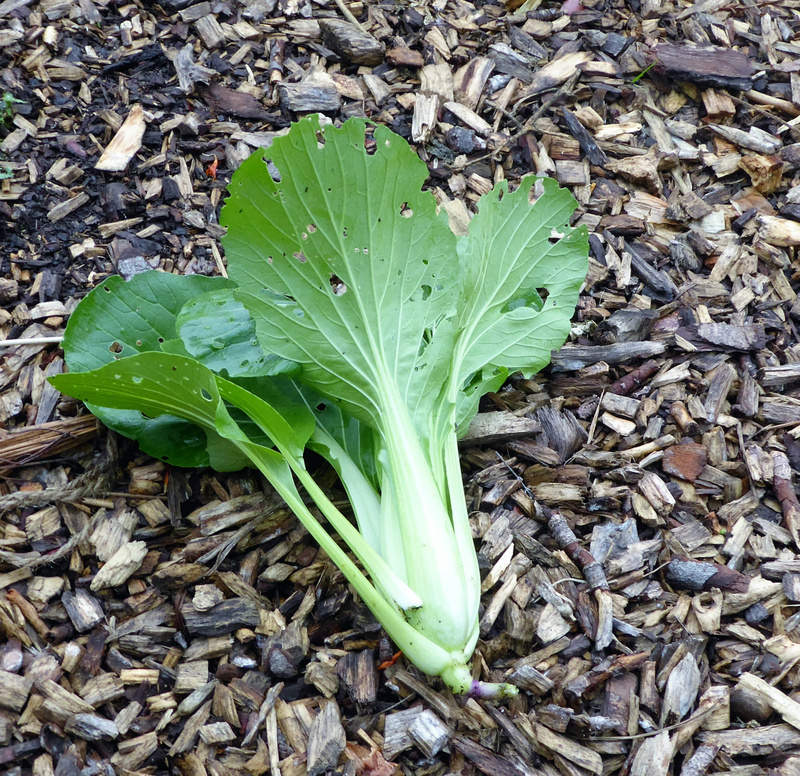 The Pak Choi plants will stay until they get eaten ...hopefully by us, not by slugs ... and the Giant Red Mustard will grow in the mini-tunnel all Winter. This gave us such a good crop last year that this time I have planted 12 plants rather than 6. 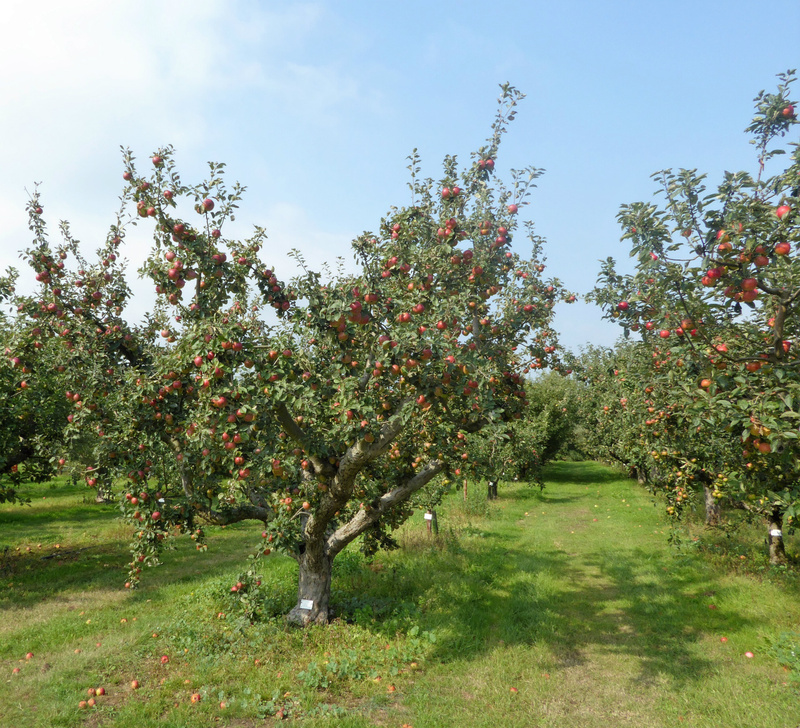 Their orchards are aweinspiring at this time in the year, with so many different varieties of apple it almost becomes a blur. 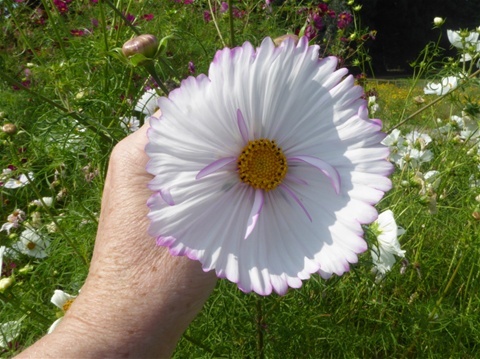 I saw a couple of cosmos that are now on my list of must haves for next year: an orange flowered variety of C sulphureus that is as tall as me, and a cosmos with a single pinked-edged petal that runs all the way around the centre to form a large cup in pure white, or with a faint pink tint: C. bipinnitus "Cup Cakes". Just gorgeous and I was totally rapt. 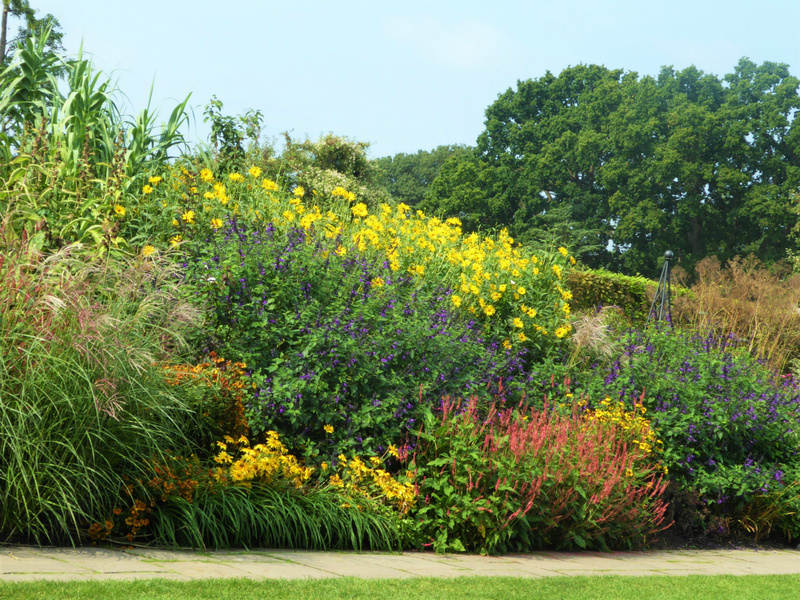 I usually end each week with a photo or two of our flowers, but this week the plants at Wisley are the ones to share. I hope you enjoy them! 12th September - Tomatoes rule, ok!! 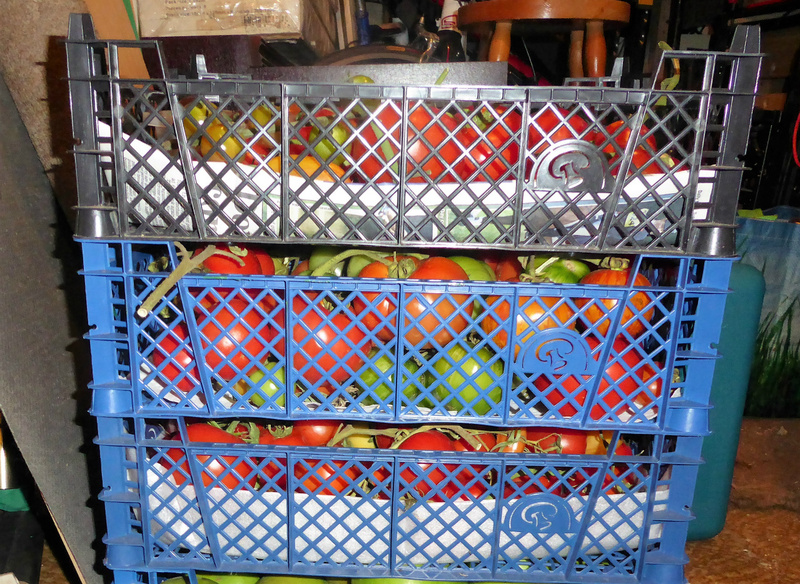 After I wrote about the possibility of blight last week, I decided it was tempting fate too far to leave all those lovely tomatoes sitting out on the plot, so I cut the trusses and brought them home to the safety of our kitchen, boxes and boxes of them! It was definitely the right decision though as the plants in the giant cloche succumbed, and even some of the fruit I brought home developed the telltale brown patches. These were Roma, which must be especially sensitive. I left the Crimson Crush ones, which are advertised as "blight resistant" and so far they are fine. I hope they continue, as they are decent sized juicy tomatoes and I would happily grow them again next season. 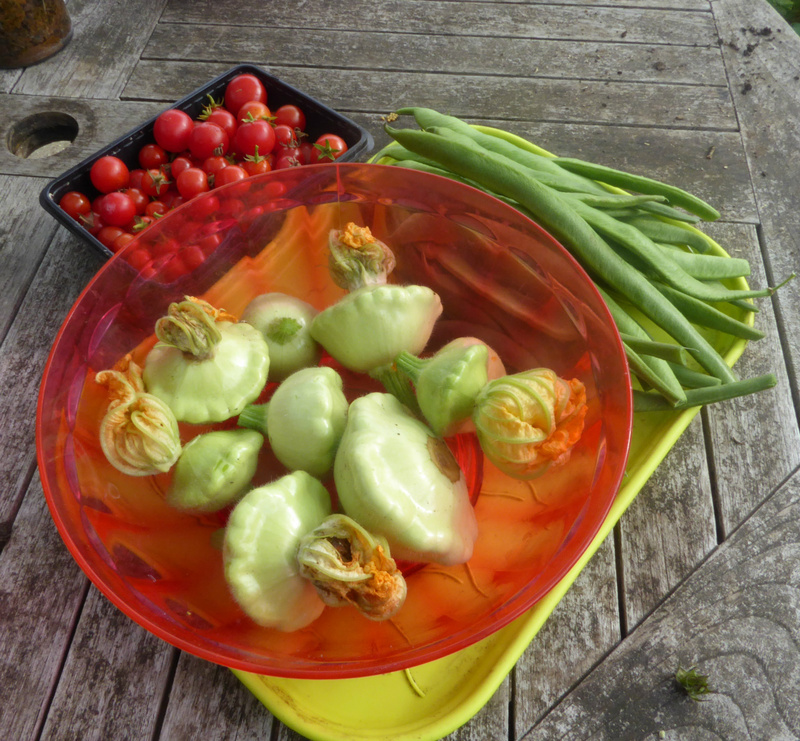 This week's Harvest Monday obviously includes tomatoes, many, many tomatoes, but by the end of the week the mountain is down to two bowlsful in the fridge, plus two trays of green ones sitting in the kitchen. They were transformed into more Yellow Tomato Jam with Basil, two large batches of "cook-in" sauce - one spicy and one with garlic & basil - and jars of roast tomatoes in oil, with rosemary & garlic, plus another batch of tomato ketchup . 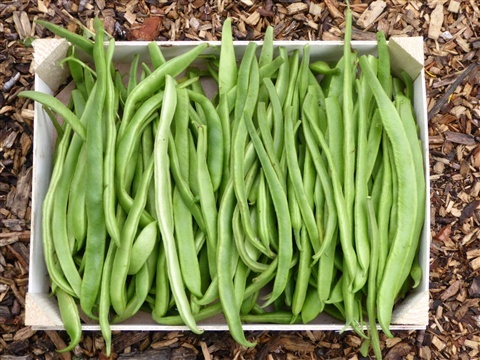 I am still harvesting Runner Beans, which have found their way into one of the batches of sauce as well as gifting plenty. There are only so many photos of the same produce you can take, so please imagine the large boxful of beans, as well as plenty of cooking apples and a few more courgettes. 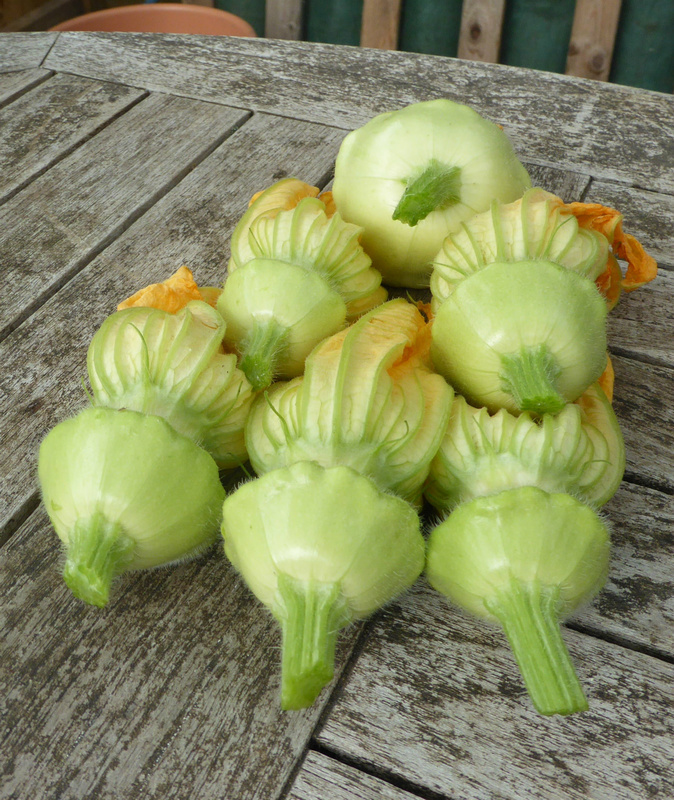 One of the new-but-continuing harvest are pattypan squashes. I still have several left from last week, and had a sudden brainwave as to how to avoid gathering even more large white flying saucers to sneak into our meals ... cut them when they are tiny! They look quite inviting like this, and remind me a bit of artichokes. Tomorrow these will be quartered, fried in olive oil with garlic and lemon and make a different side dish for our dinner. They still have their flowers attached but I shall be taking these off, as by tomorrow they will be less fresh and not be very nice to eat. 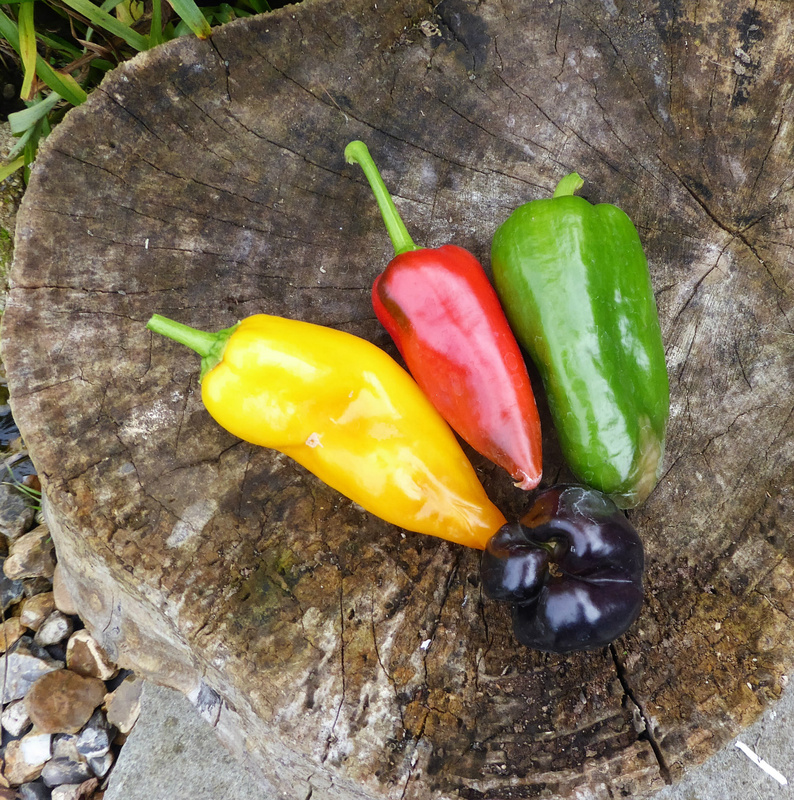 These were all cut from the one remaining plant, and I wonder if taking them so small will lead to more being quickly produced. They are a variety called Pale Green Tint, and now you can see why! We are still harvesting blackberries & raspberries, and this year I have been determined to avoid freezing big bags of these. It is difficult to use them, and does not make the most economical use of our precious freezer space either. Instead, I have cooked pie/crumble fillings of blackberry & apple, raspberry & apple, and rhubarb with ginger and frozen these in blocks using the dish I usually cook crumble in as a mould. By oiling the dish and lining it with two layers of clingfilm, the block was fairly easily removed, to be tightly over wrapped and stacked in the freezer. Lots of warming puddings to look forward to, although as the fruit is already cooked the blocks are not restricted to being used in hot puddings. 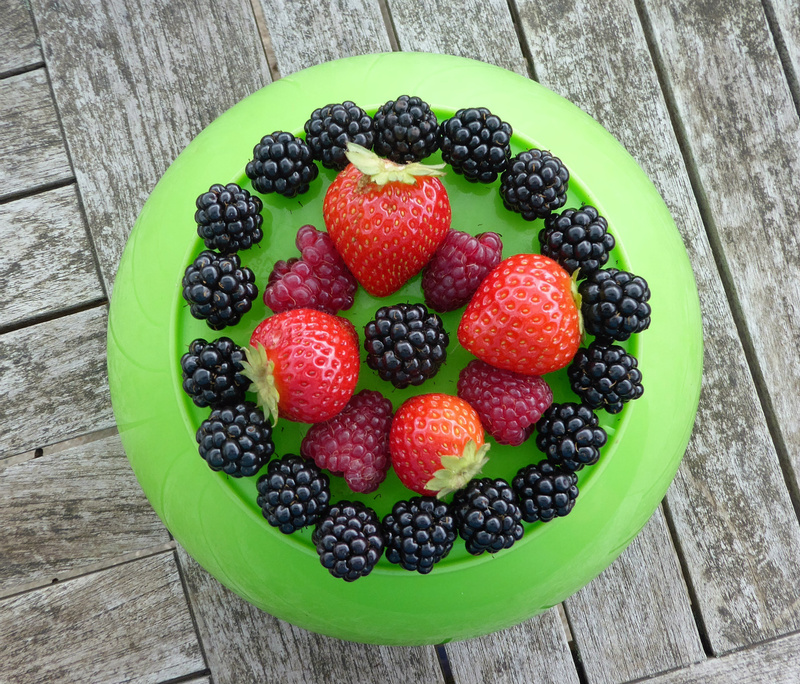 Once they are thawed, the fruit can be served cold too. A quick mention of strawberries too: the late fruiting variety is doing well now. The plants are in a growbag up on a table, awaay from the attentions of rodents. Next season we shall grow all our strawberries raised up like this. A net easily keep birds off too. 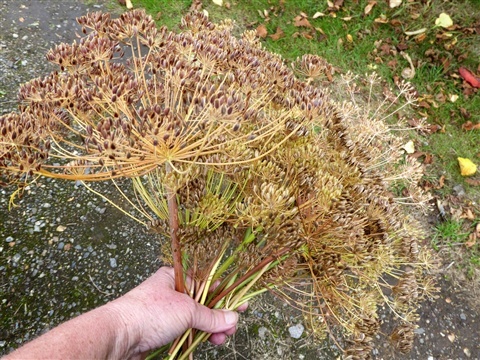 New harvests this week include seeds. For the first time I remembered to cut the poppy seed heads before all the seeds scatter. These will be added to breads and poppy seed cake. This amount (see the large photo at the end) is from just two plants that arrived from goodness knows where, and I think enough seeds will have escaped to give us some plants next year. At least I hope so! Fennel seeds will add their aromatic flavour to chutneys, curries, quiches, sauces, chicken or fish dishes... in fact anything that comes to mind when we are cooking to be honest. 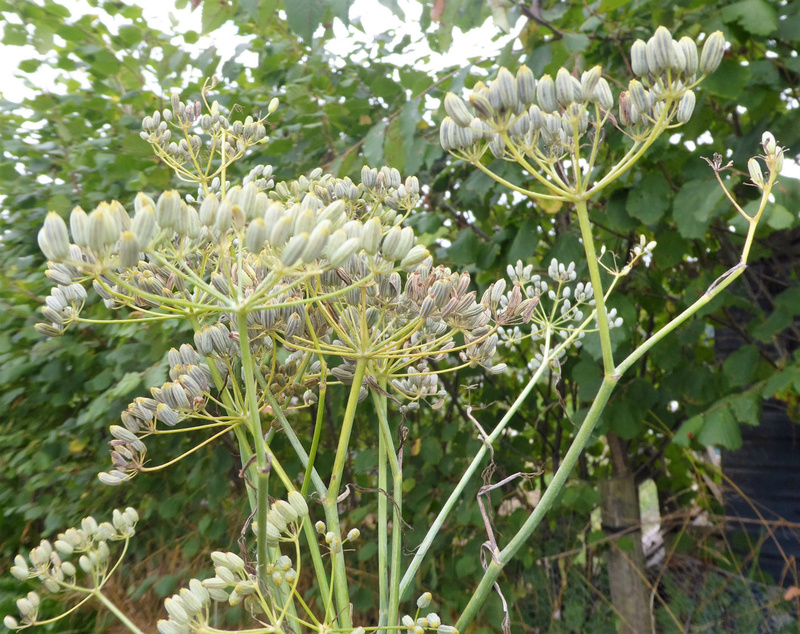 It is a very strong flavour though and a few seeds can provide that background aniseed-like taste. They are also good chewed just as they are. The dill seed heads are beginning to dry on the plant and so I cut them before too many seeds are lost. Given the amount of flowers I have cut for adding to pickled cucumbers, there is an amazing number of seeds heads! 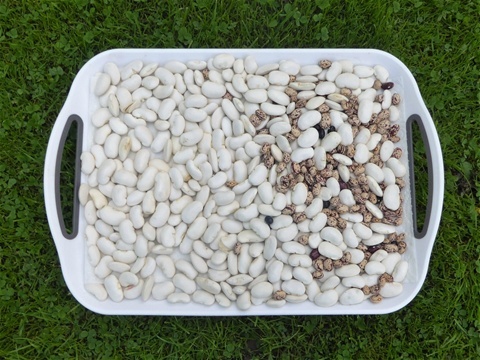 When the seeds are fully dried they will last for ages. They go especially well with potato salad and cabbage-based dishes. I am gradually bringing the shelling beans home so that they can dry thoroughly before being stored in airtight jars. 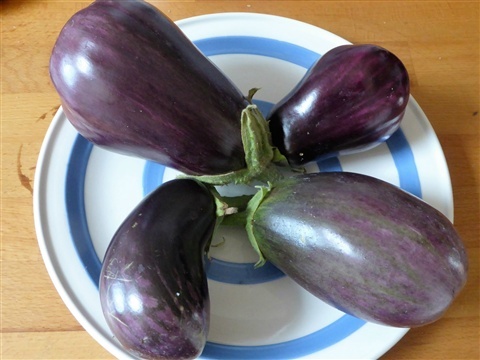 Most of the Greek Gigantes are on a large tray and they go out into the sunshine at every opportunity. Interestingly, the ones that are completely dry sound quite musical as you run them through your fingers, but the others sound dull. Good way to tell if they are ready to put in the jar or not! More about these and the borlottis to follow in a week or two. 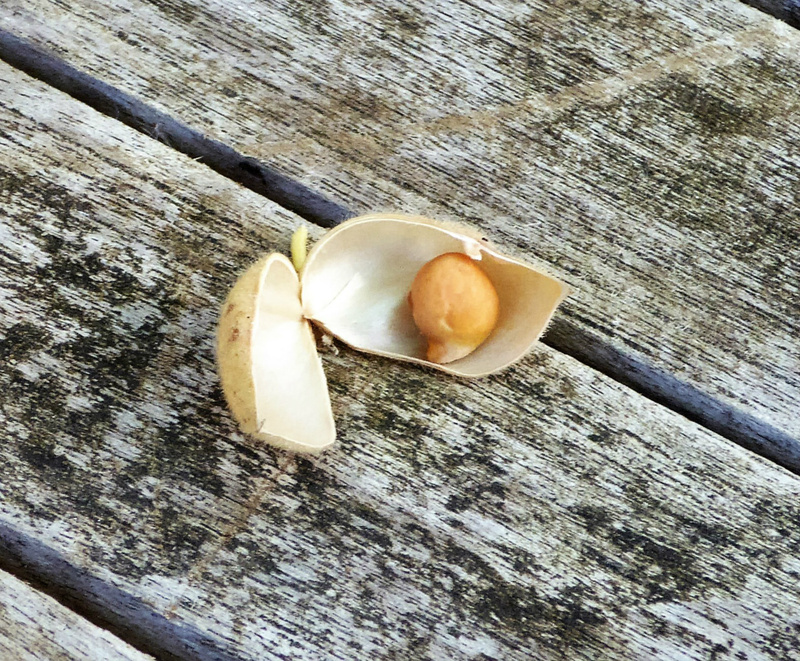 Now this might not seem very exciting to anyone else, but... it is a chickpea, a real live, ripe chickpea grown on our plot!! 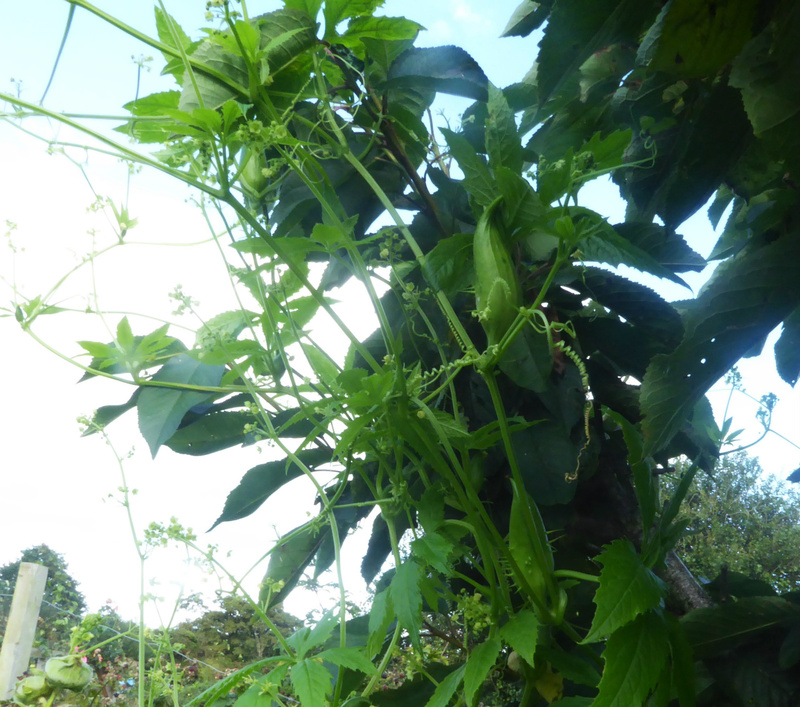 After that dastardly rabbit nibbled off the plants 10cm from the ground when they were in flower, the chance of any sort of harvest seemed remote indeed. 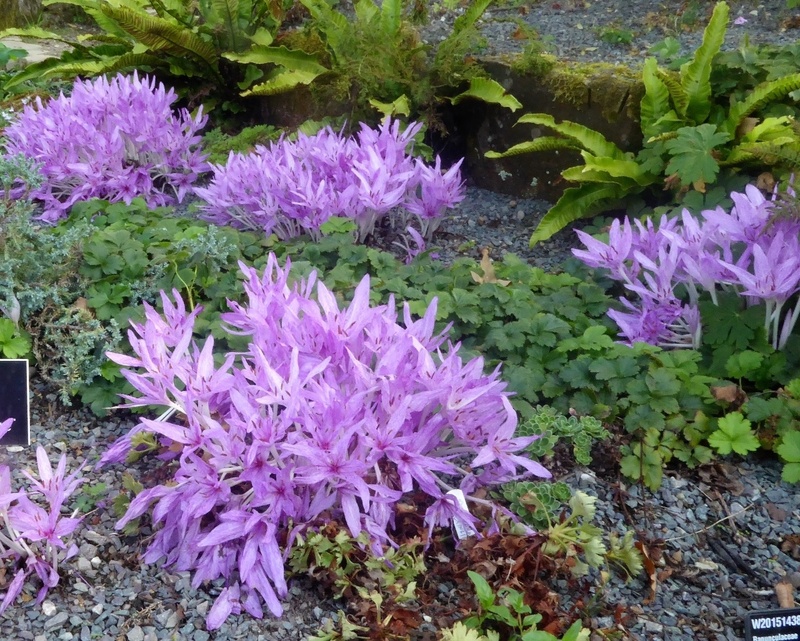 But I reckoned without the driving force that plants have to grow wherever possible, and the cut-off stems grew new shoots and some of them even flowered. There are several that have set pods and this is the first one to ripen. Our very own home grown chickpea. There are a few more to come, and they won't even make enough for a meal, but it proves that it is worth having another go next year. Minus the rabbit! 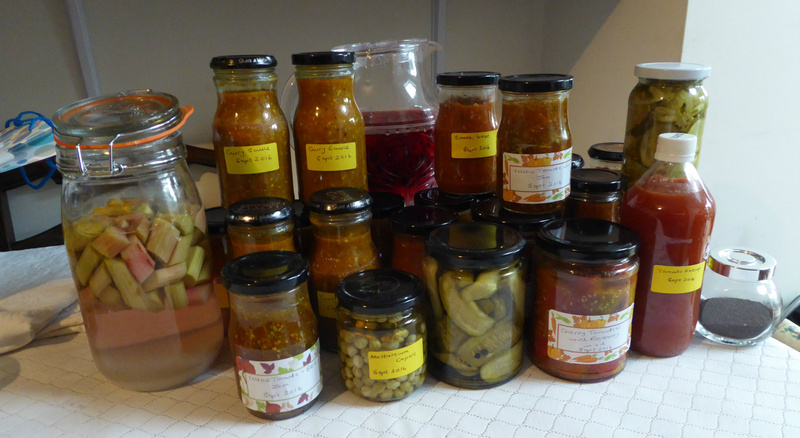 Here are all the preserves from this week: Yellow Tomato Jam with Basil, two different cook-in sauces (8 jars of each) dill pickled cucumbers, pickled nasturtium "capers", cherry tomatoes in olive oil with rosemary & garlic, tomato ketchup, raspberry gin and rhubarb & ginger vodka. Usually by now we leave the rhubarb plants to rest, but we picked some for last week's Show and this seemed a good use of what was left after making the pie filling. The jar of poppy seeds is ready to put away too. The storage shelves in the garage are almost full. We spent a whole day checking through what was left from last year: what was still good was brought to the front and anything past its best or not able to be eaten, such as the solid-as-concrete blackcurrant jam and the grey looking pickled cucumbers for which I used the wrong salt, were disposed of, jars washed out and labels removed. 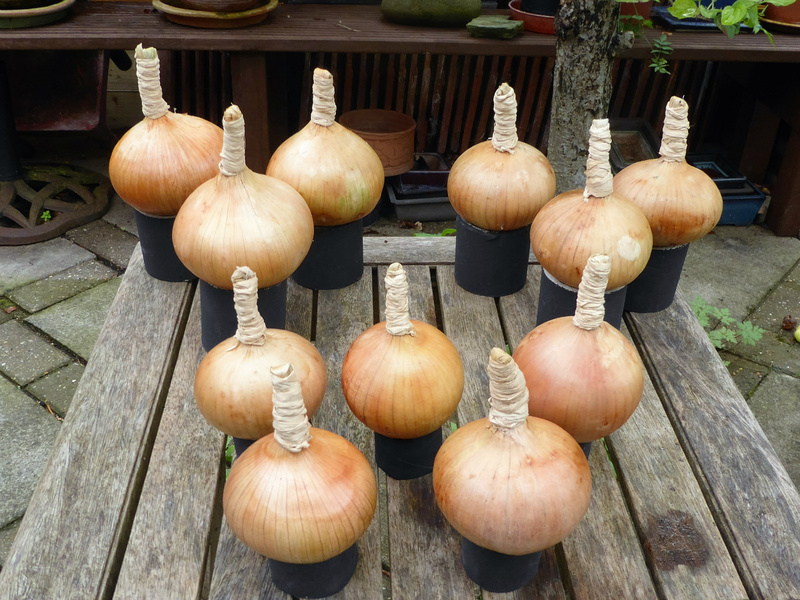 Some of them were well and truly stuck and no amount of soaking would dissolve the glue. It took Abi a lot of scraping and white spirit to get them off, but at least the jars are sparkly clean and ready for re-use now. 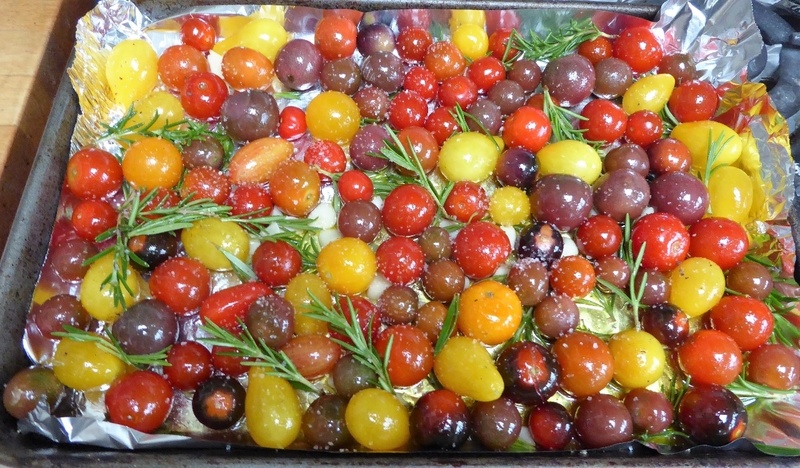 I just need to decide what to make with the rest of the tomatoes! So it is worth putting in the time right now for sure! 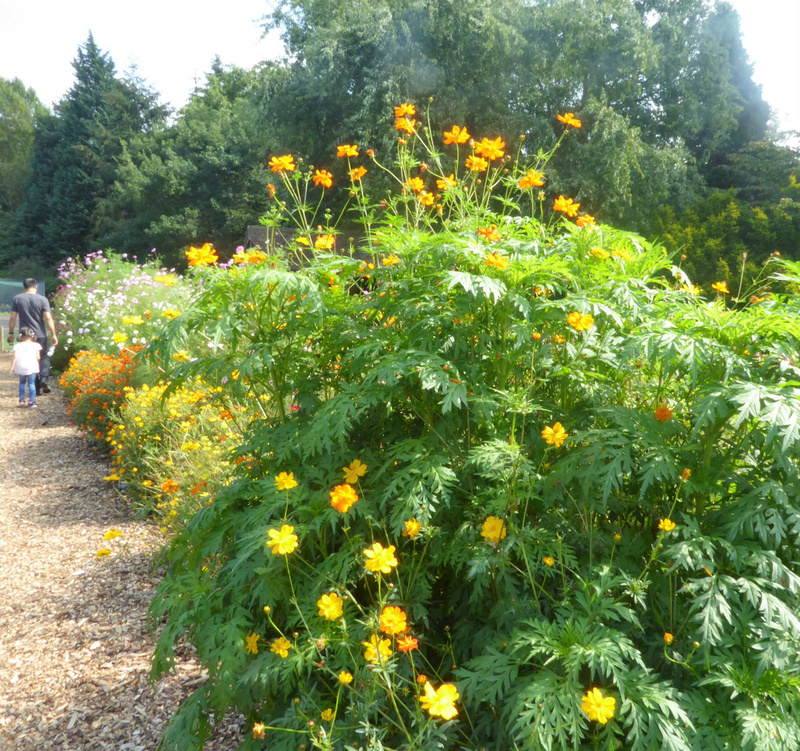 We still have masses and masses of flowers: dahlias, indian and french marigolds, calendula, lavender (due for harvesting next week) zinnias, pelargoniums, petunias, cosmos, carnations and now, penstemons. 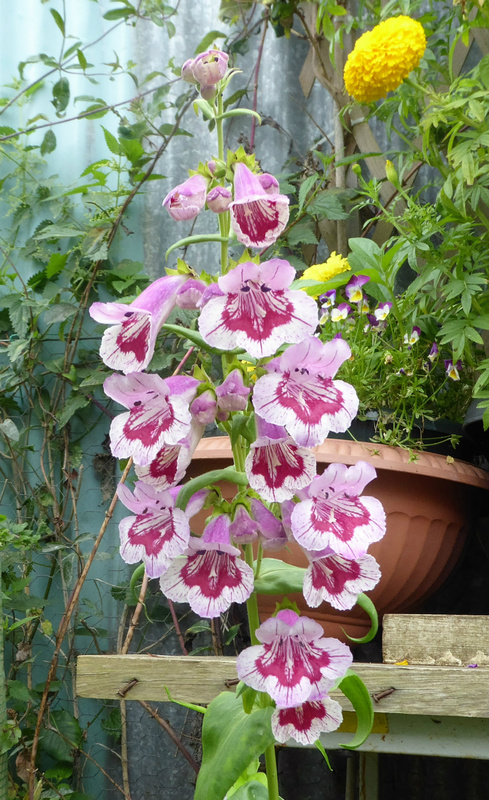 These have been grown on all Summer and this one has the most beautiful orchid-like markings inside each flower. Despite the hustle and bustle of these few weeks, taking time to appreciate and enjoy such beauty is really important. You can't be head down over a pickle jar eveyr minute of the day!! Thank you for sharing all this again. 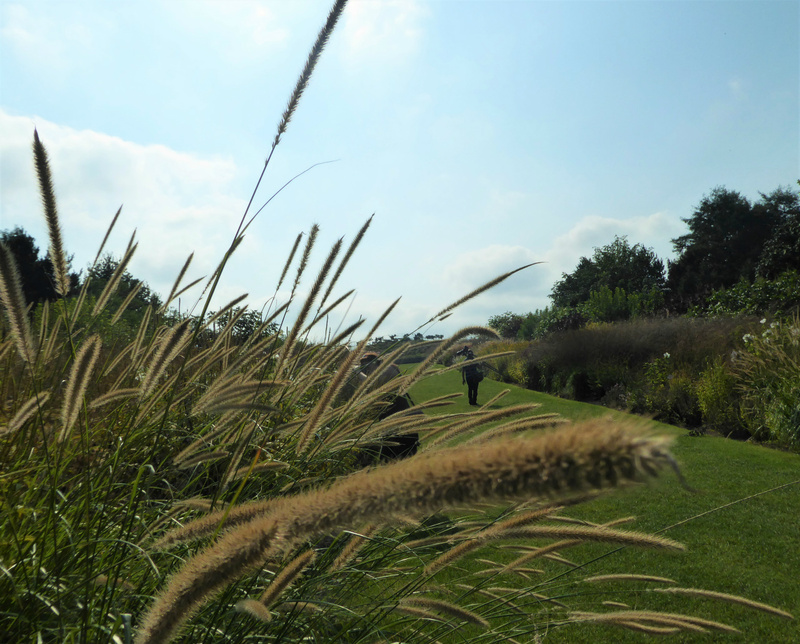 5th September - Autumn Days! 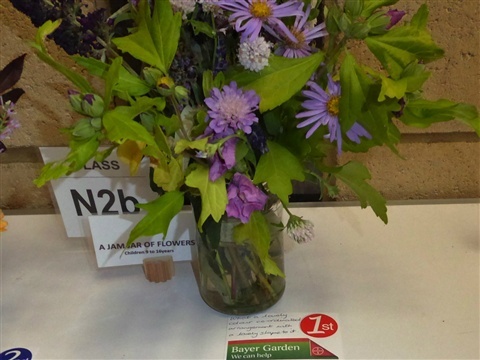 The start of Autumn is marked each year by our local Show, when we gather together the best of what we have grown to compare with others' produce on the showbench. 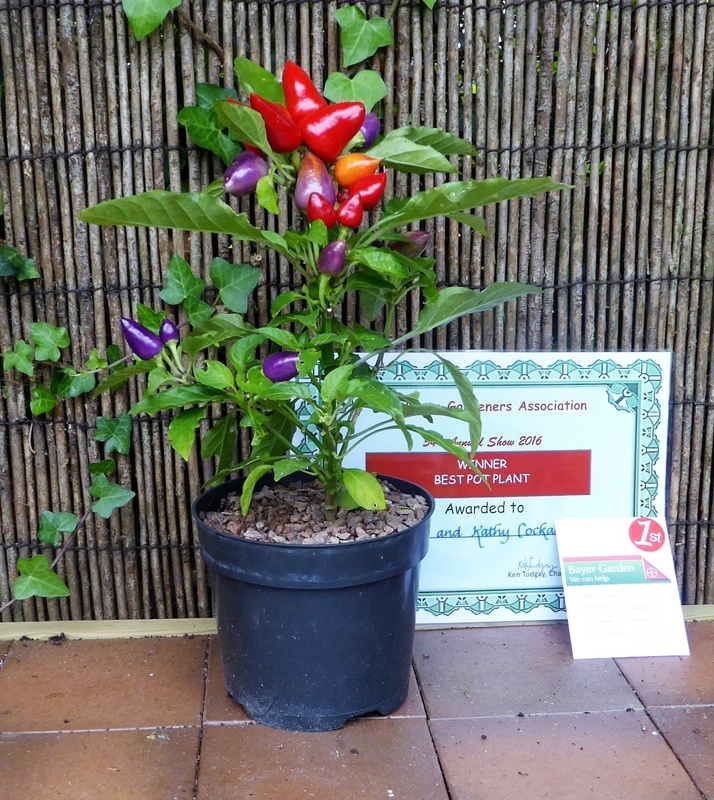 The little Razzamatazz chilli plant in the top photograph won The Best in Show for plants, and as I grew it from a seed saved from a plant the previous year, I was over the moon. It has pride of place on our table in the garden. More about the show later, much more, in fact!! Harvest Monday, where we share what we have taken home this week, comes first as usual. The last of the maincrop potatoes was unearthed! 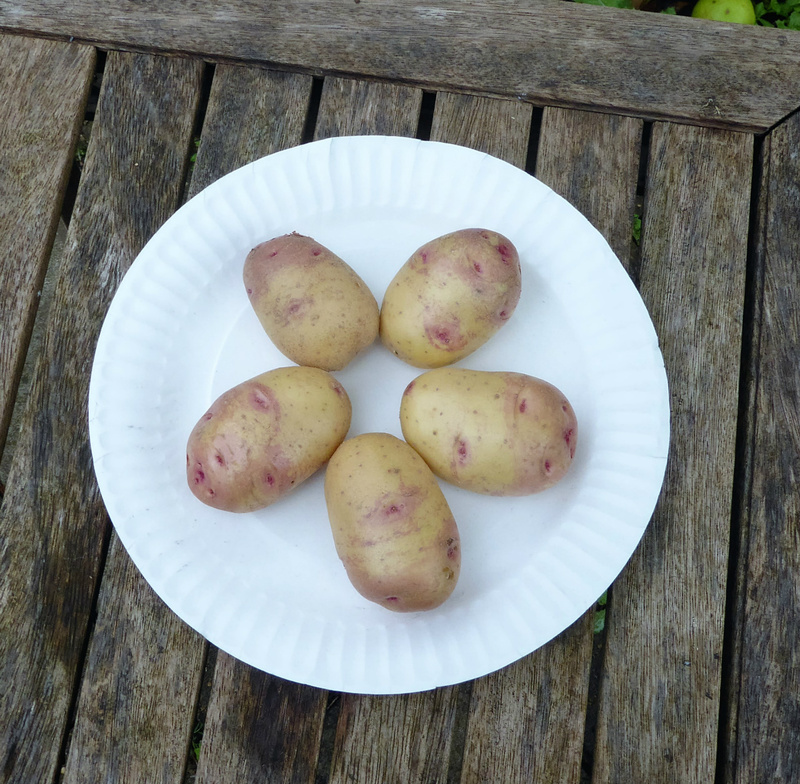 These are Ambo, which we grow every year because they get to a decent size and make very good roast potatoes indeed. 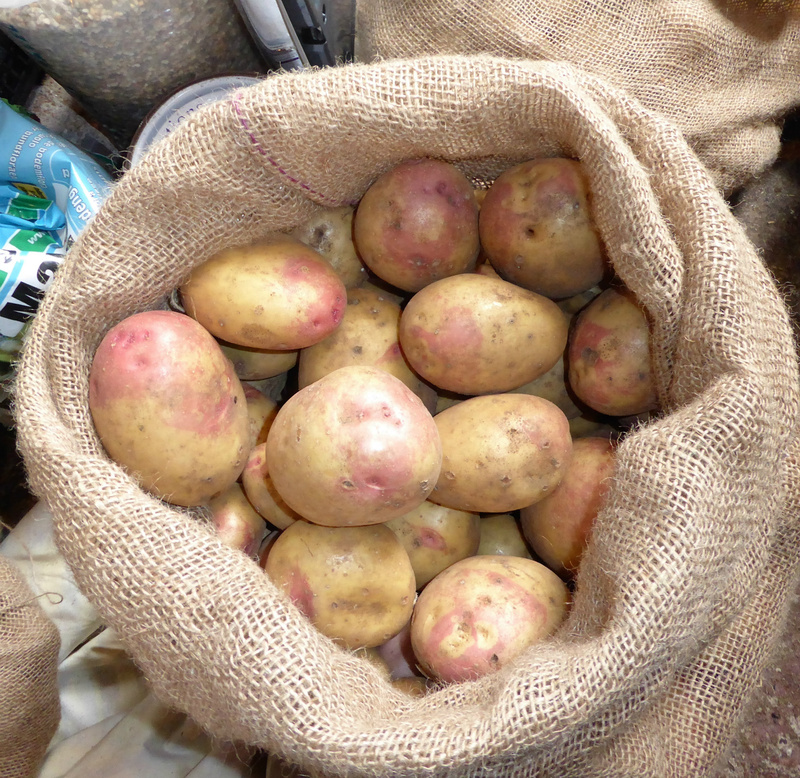 Altogether this year we have harvested 48 kg of potatoes, which is pretty good from 3 beds 1.2m by 3.6m I think. They are safely stored in the garage in hessian sacks, on heavy duty cardboard so that the bottom ones are protected from freezing in the event of a severe winter. There is a thick cotton cloth over the sacks as well to ensure light is excluded totally. 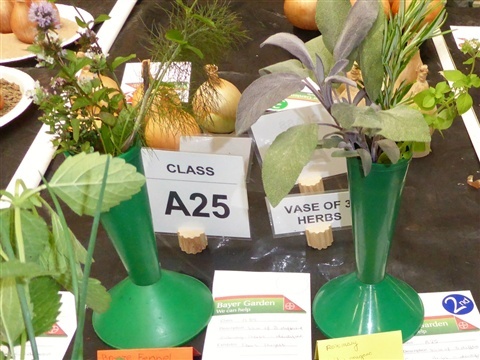 It might seem a bit of a palaver but there is no point in growing crops to store of you are not going to look after them to make sure they survive as long as possible. 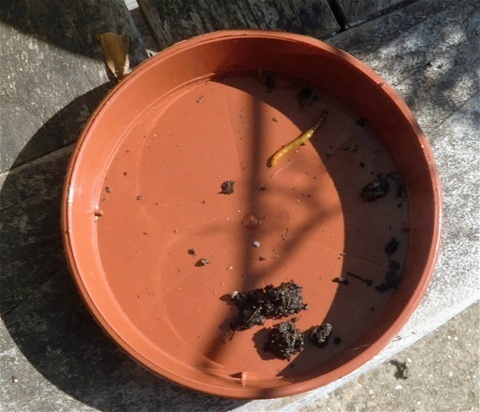 Any tubers damaged by slugs or wireworms, or an inadvertant stab of the fork when digging, are in a basket in the kitchen cupboard to be used up first. 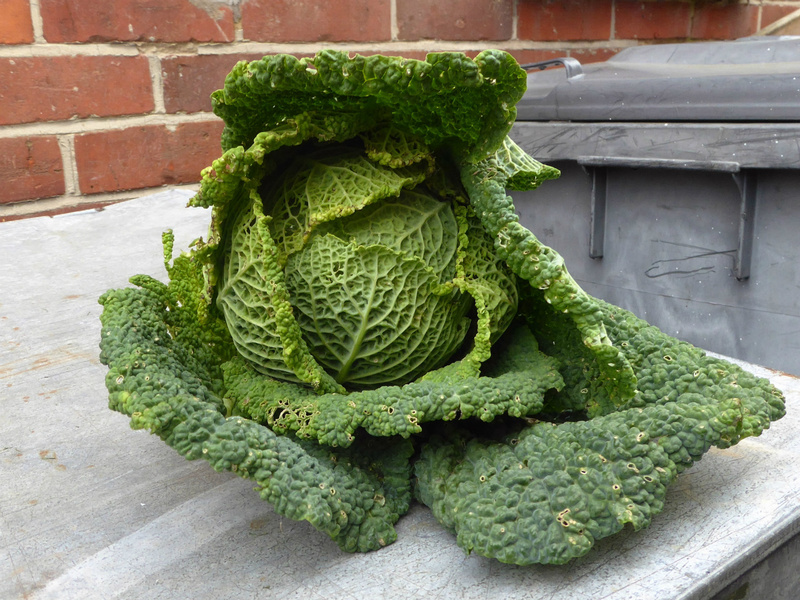 New this week we have Savoy cabbages. 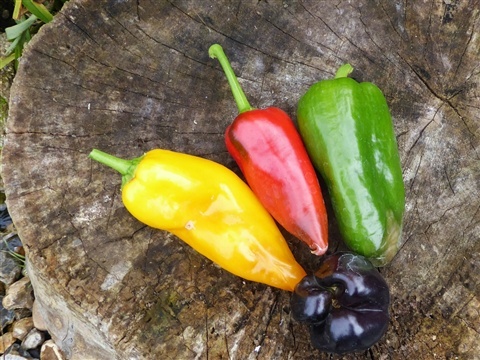 We pulled up three, two of which had already been eaten before I remembered a photograph! 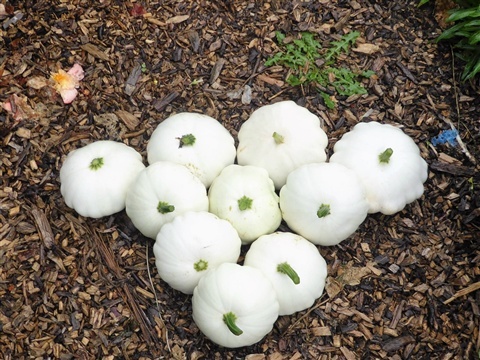 These have been grown under debris netting to escape the attentions of Diamondback moths, which reached plague proportions in some areas this year, and of common white butterflies. The ground around them was solid, which helped them make a good hard head, and the dry weather reduced the amount of slug damage too. 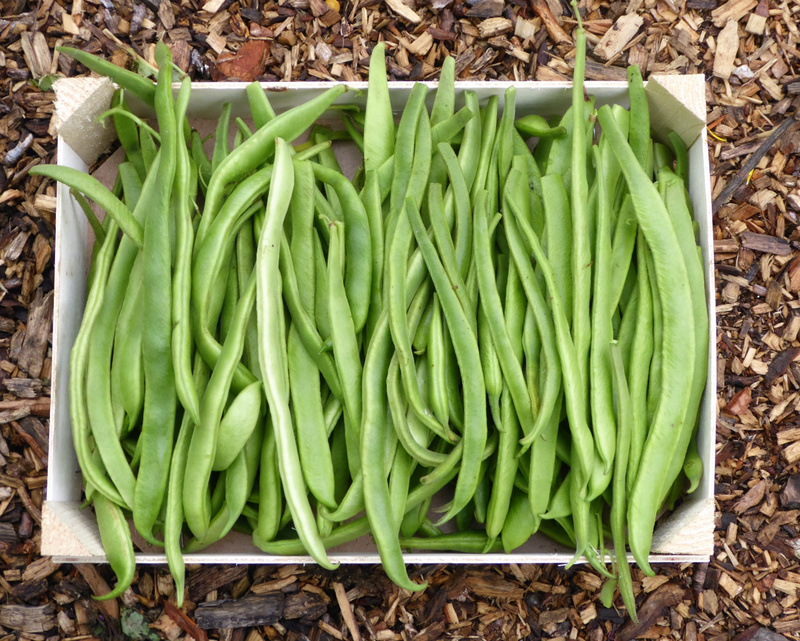 Runner beans are still producing pods, although I noticed today when I picked this boxful that there are very few flowers left. 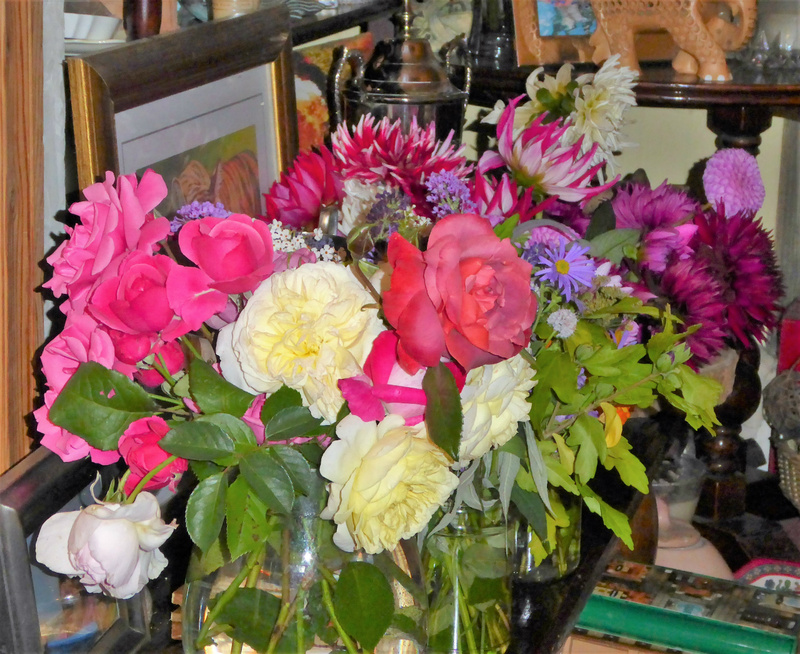 I do not need to encourage more flowers as we have had a huge crop already ... we are up to 28.48 kg! 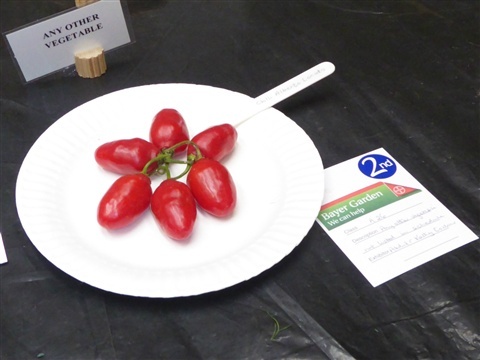 Here are some of the Alberto Locato chillies harvested this week, sitting proudly at the Show with their Second Place card. 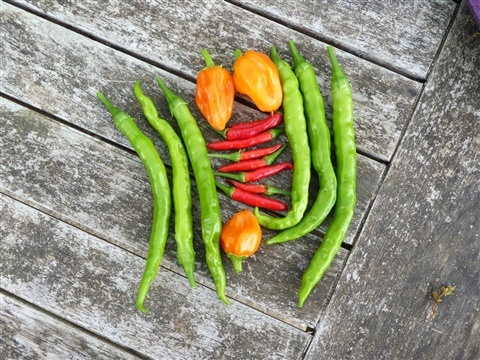 These have a good heat and enough flesh to add plenty of flavour too, when used in cooking. 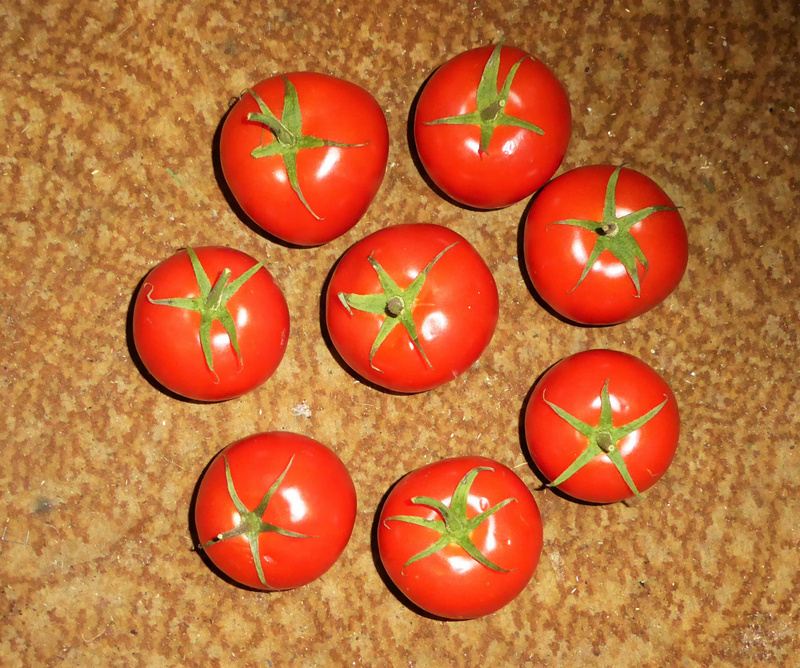 Also new are Crimson Crush tomatoes, which are a really good size. 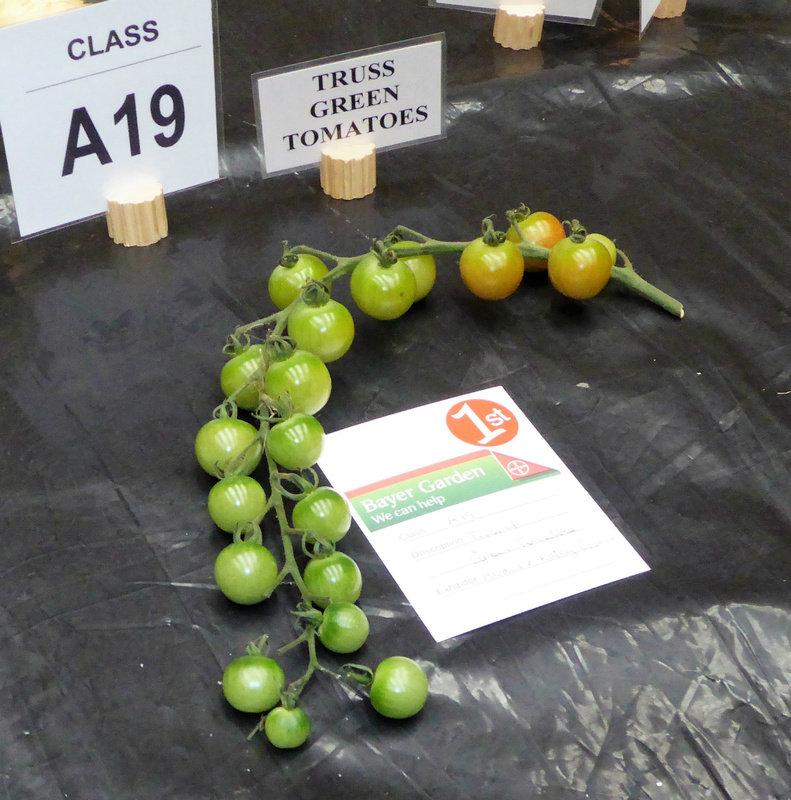 In fact they were such a good size they were too large for the Medium-sized Tomato class and were disqualified! 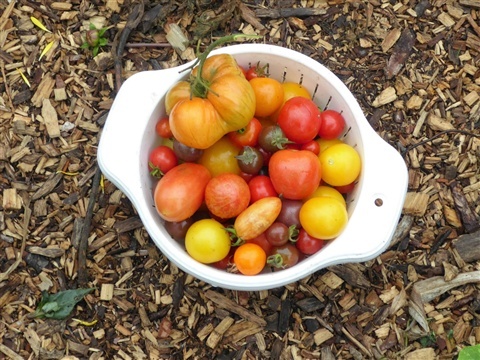 The huge and varied tomato harvest continues, as without any sign of blight so far they are still growing strongly. I may speak too soon.. the weather has turned very humid and a Smith Period alert is pending, I'm sure! 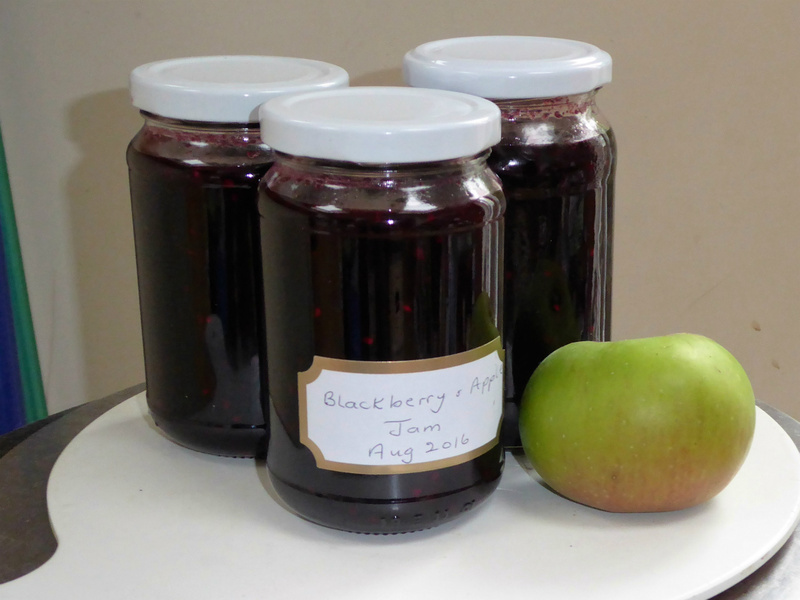 The blackberry harvest this week has been turned into Bramble Jelly, and, together with some Bramleys, the Blackberry & Apple Jam shown here. And now for more about the Show. 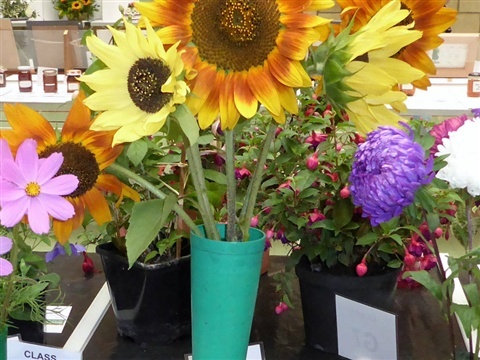 As readers of Alittlebitofsunshine (and other growers) will know, this season has seemed one long round of battling with pests in various guises, disease and drought, so we were not optimistic about the qualaity of our produce on the show bench this year. But with the thought that we can only show what we have, we pressed ahead and entered most of the vegetable classes, some of the fruit, some of the flowers, every category for plants and for preserves and, rather ambitiously, all the photography classes as well. 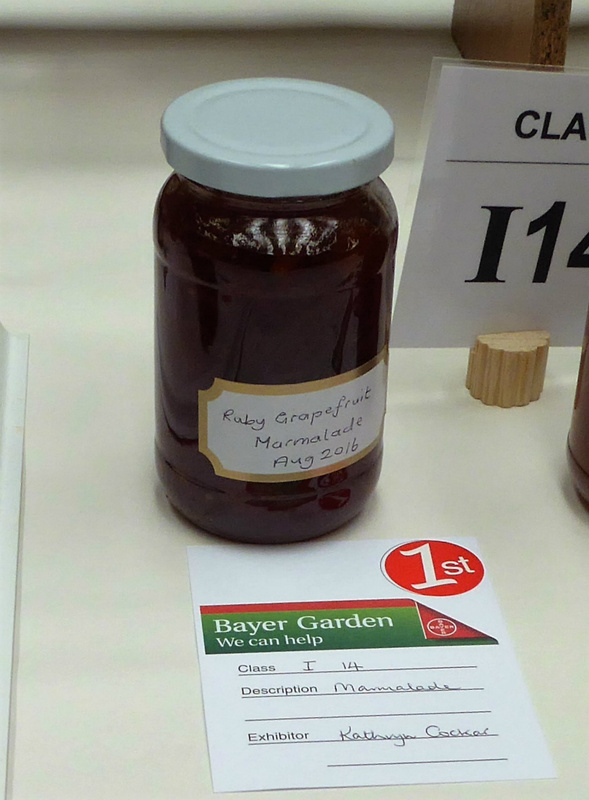 Four of our granddaughters boosted the children's entries, which was great! 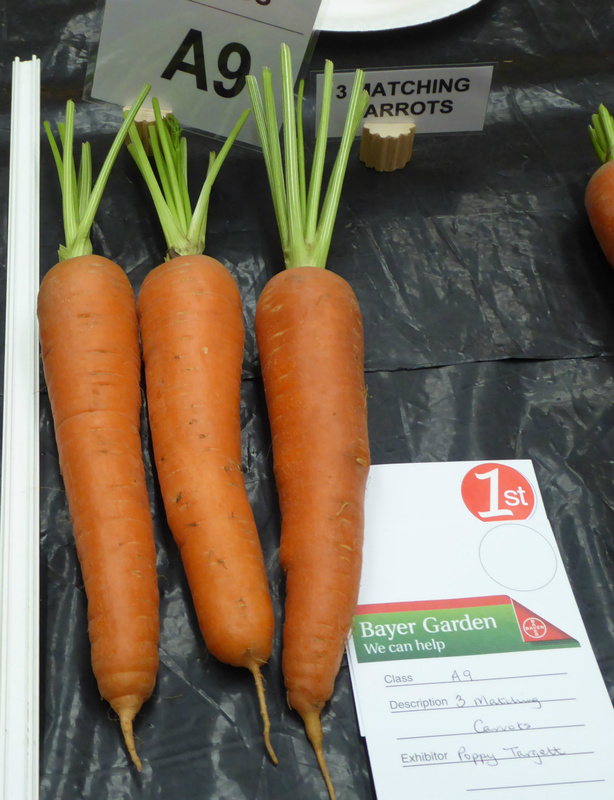 Let me point out these are NOT our carrots but brought by Pearl, GD No 2, from her garden. Really good, aren't they? Big is not always better! 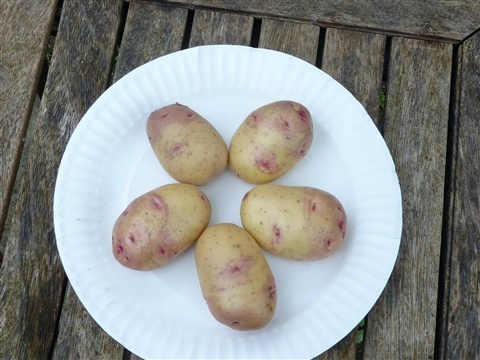 These Amour potatoes are very small indeed, but well matched, so took Second Place. Our white Casablancas were First in their class. 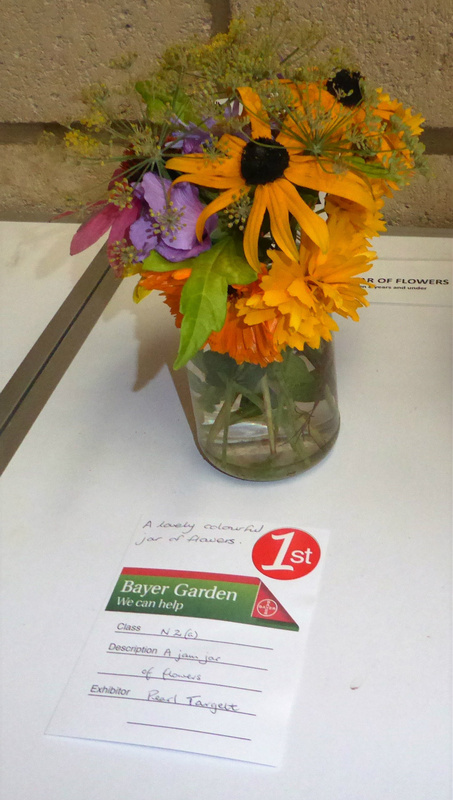 We chose sunflowers for our Vase of Annuals, which won another First. 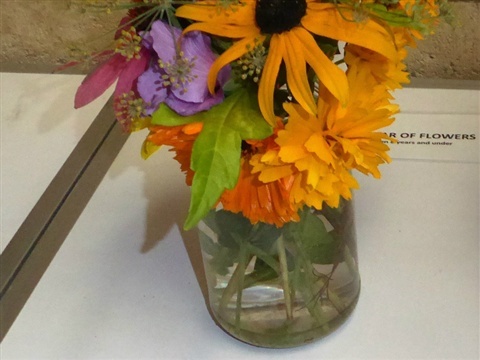 Our Perennials also won a First place, with Verbenas, Rudbeckias and white Japanese anemones. 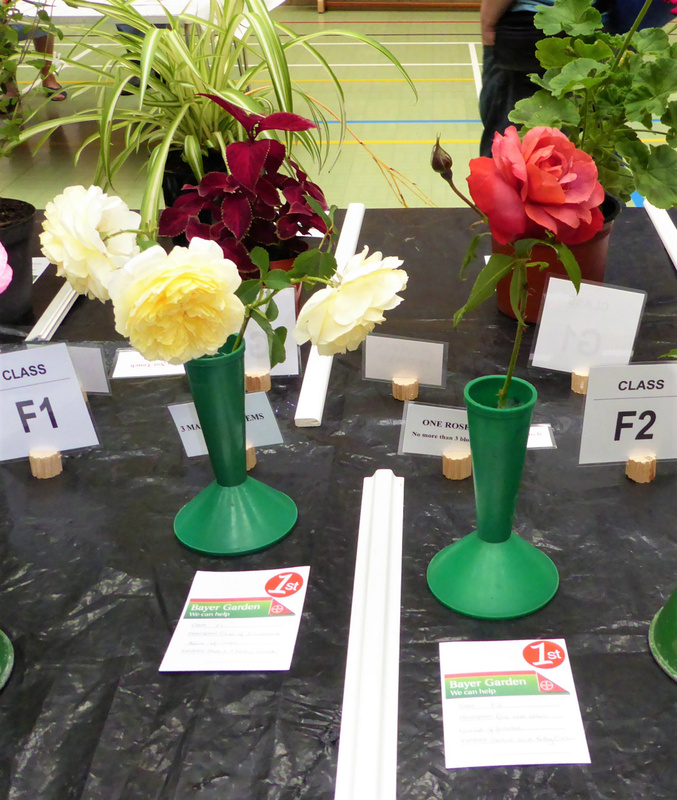 The vase of fuchsias was awarded a First as well. 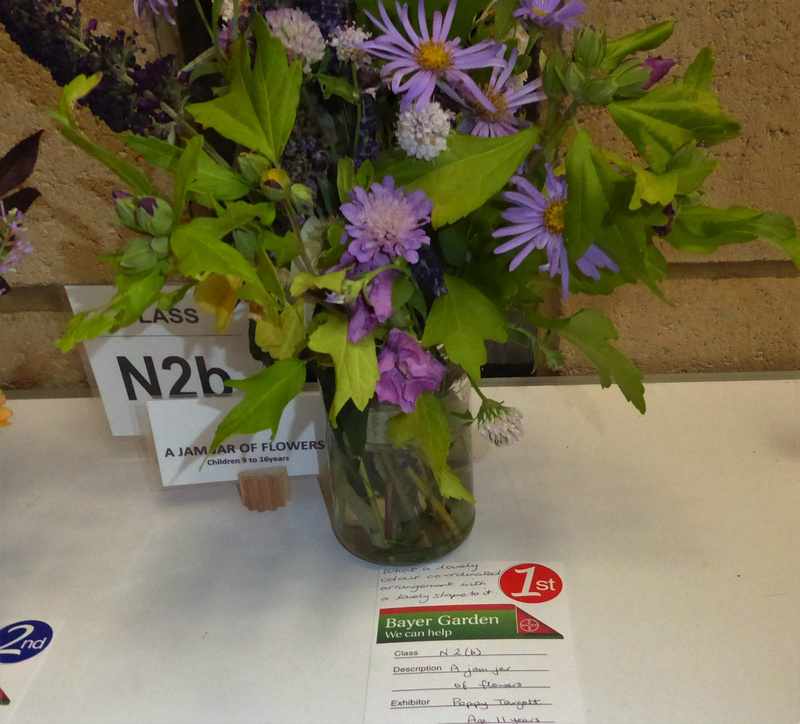 Not to be out done, Pearl had a First Place for her jam jar of flowers in the under 10s Category. and Poppy had a First as well in the Over 10s. 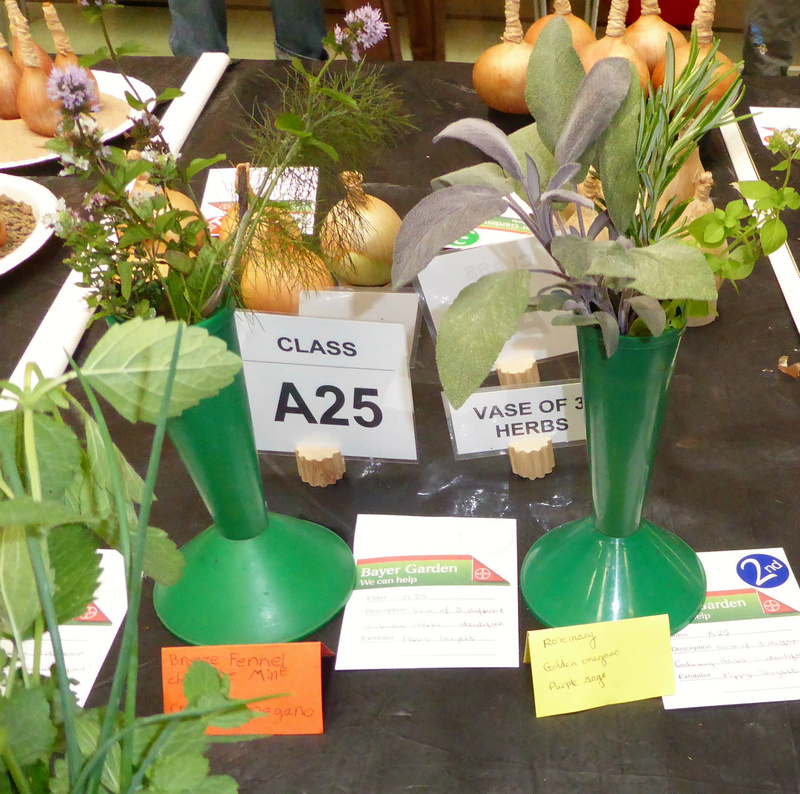 And at the end, we were awarded The President's Cup for the most points in the Vegetable, Fruit and Flowers classes combined (14 First, 12 Second & 10 Third) The Rose Cup, The Pot Plant Cup, The Fothergill's Cup for the best pot plants grown from seed (The chilli plant that won Best in Show) the Preserves Cup and I also won the Photography Cup, with Abi coming a close second. Pearl was awarded the Junior Youth Cup, and Poppy was second by one point in the Senior Youth Cup. 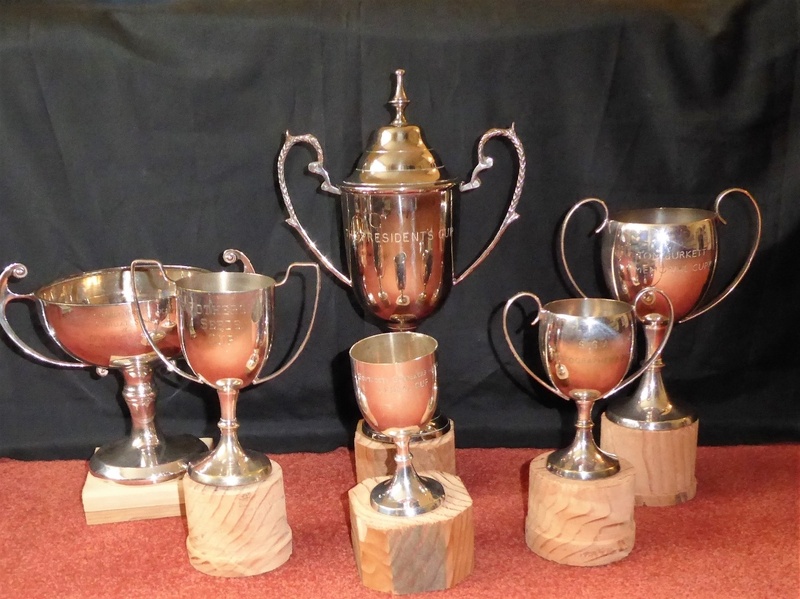 It all got a bit overwhelming to be honest, but here, for posterity is a photo of our cups, with their temporary wooden bases... they have gone away to be engraved. 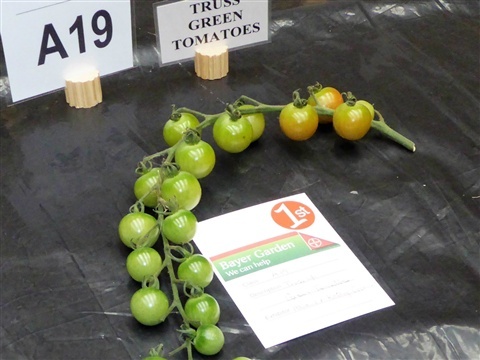 What was lovely was how pleased the judges seemed for us, and how upset they were that our entry to the Show Tray was disqualified as it had only five tomatoes instead of six. 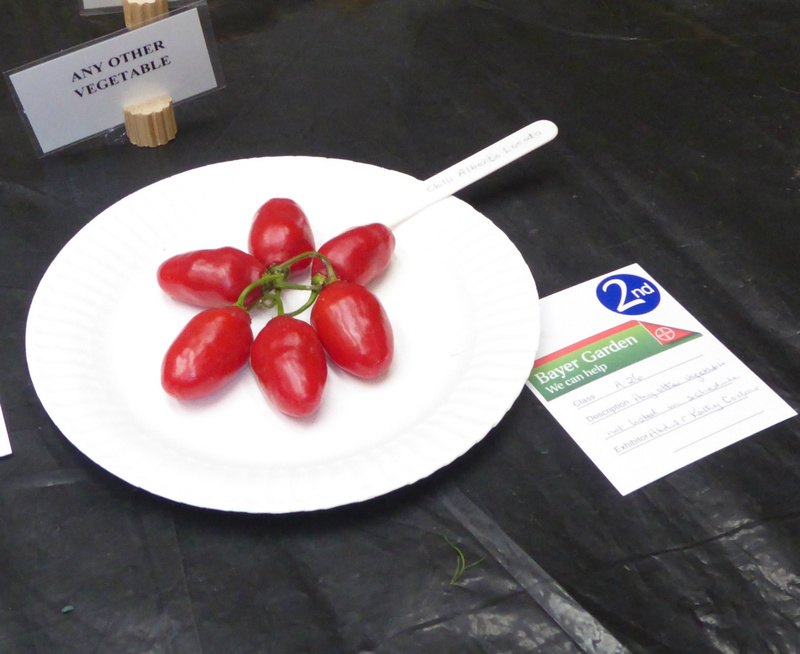 Yes, those same big, fat red ones that were disqualified from Medium Tomatoes for being, well, too big and fat!! 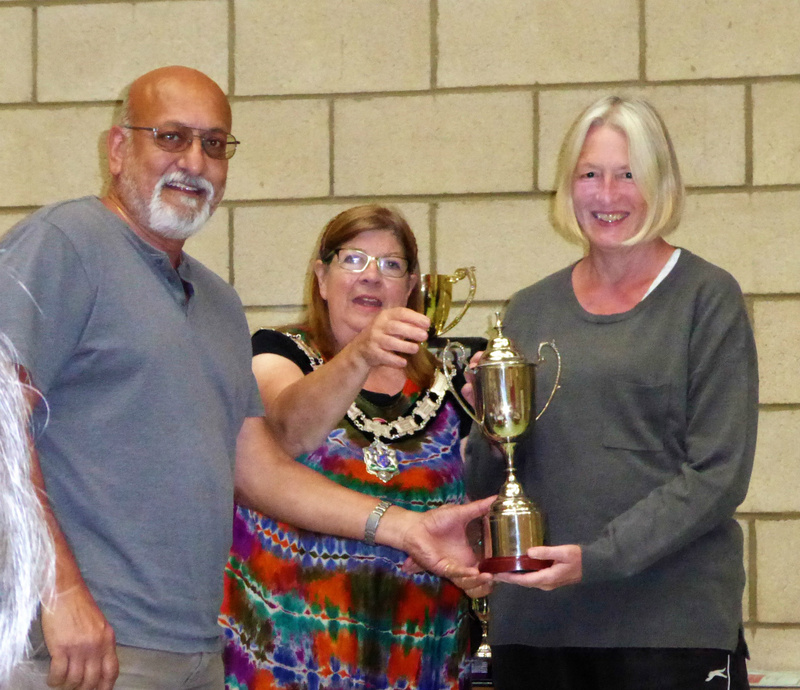 We were were very grateful to the committee, who organised the event seamlessly again this year. And other members of the family seem inspired to have a go next year, which is really great. And Pearl receiving her Cup too. 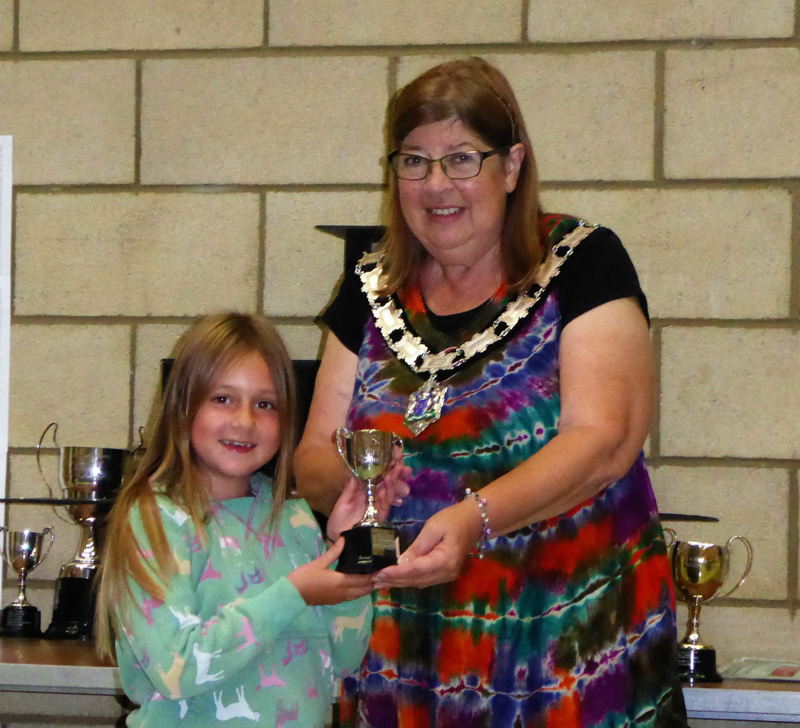 Thank you to Poppy for taking the photos at the presentation! 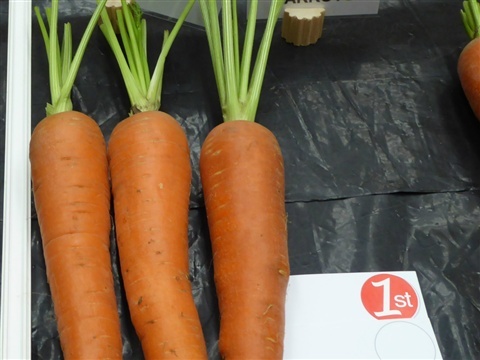 And we must not miss out the other Star of the Show: our Jermor shallots won the Best In Show in the vegetable classes!! 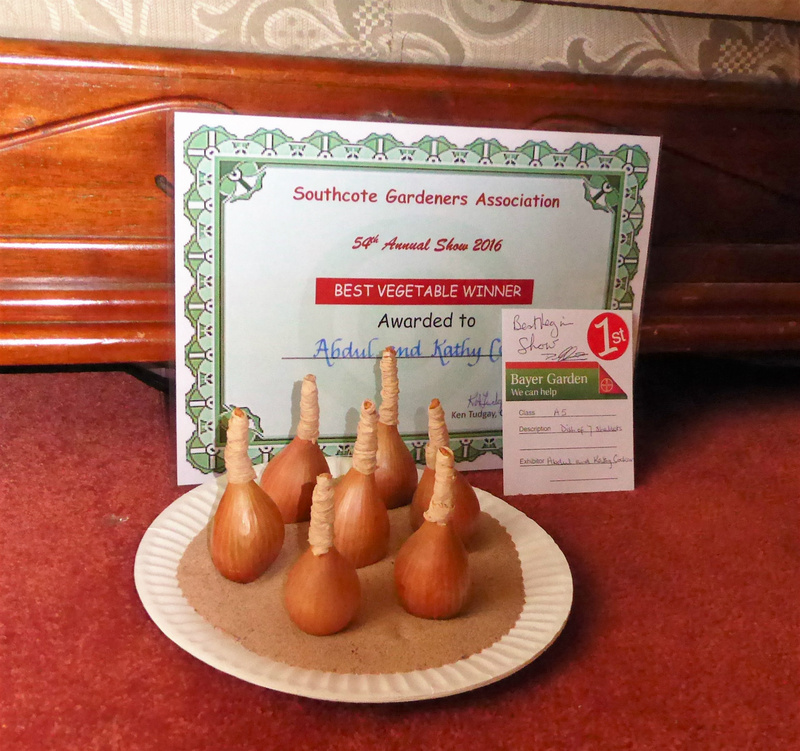 That was the icing on the cake for me, as every year I think our shallots are good, until we arrive and see other exhibitors' plates. But this year ours were really good. We are so proud of them that we have them sitting on the table here still. Eventually they will have to make their way to the tray in the garage, and be lined up for use in the kitchen of course, as happens to them all. 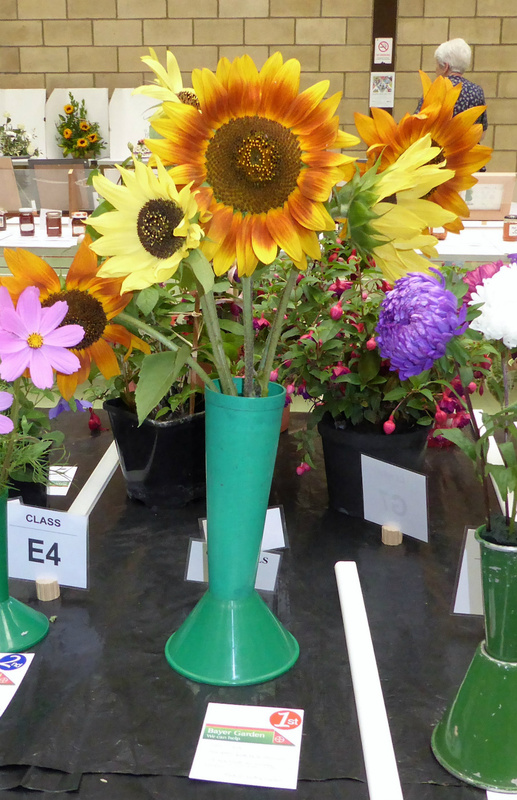 And here are some of our rather beautiful flowers. Thank you for reading to the end!